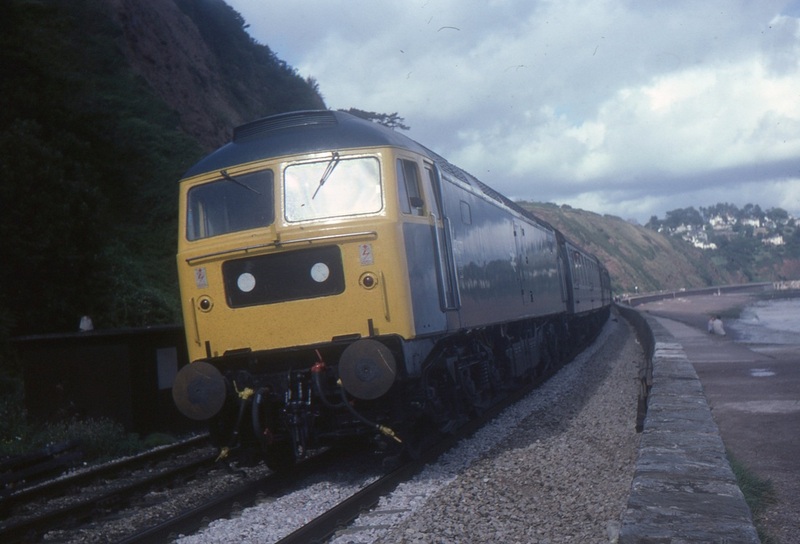 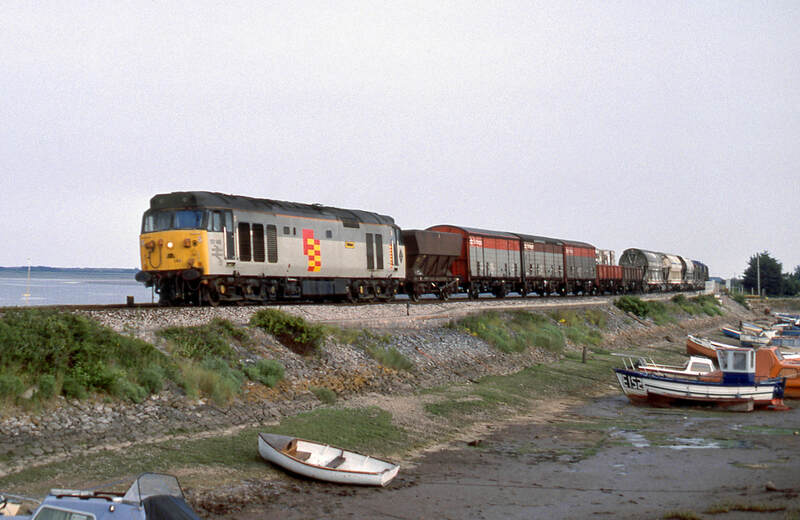 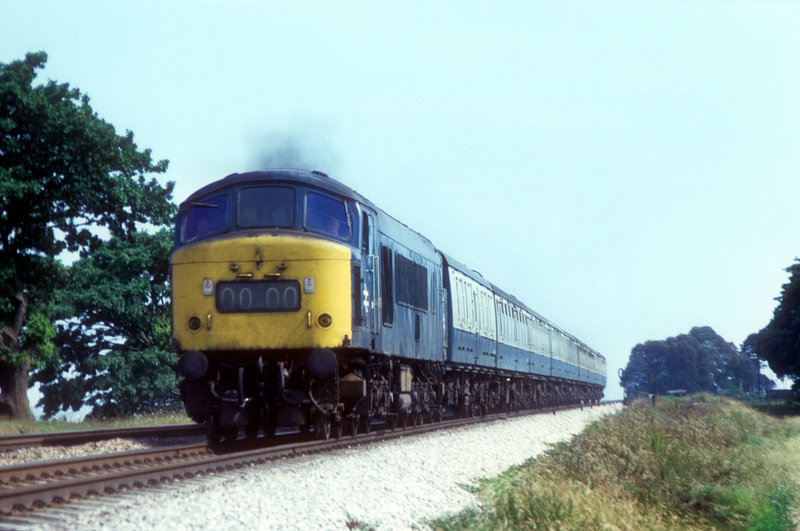 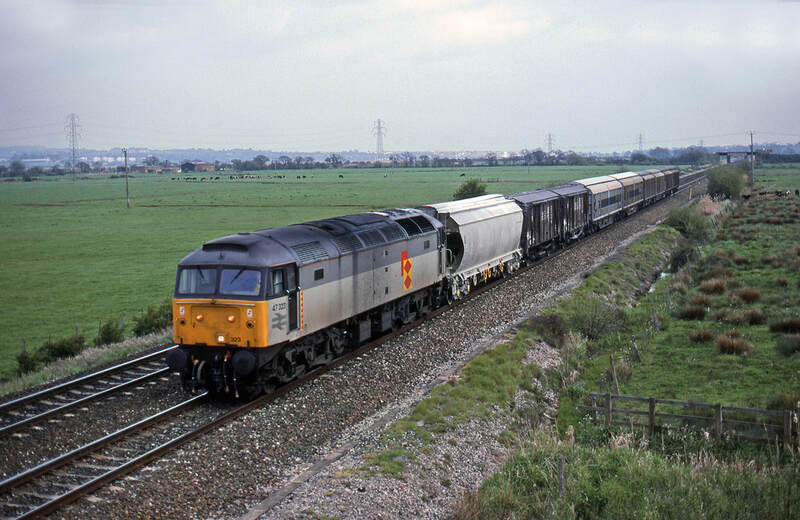 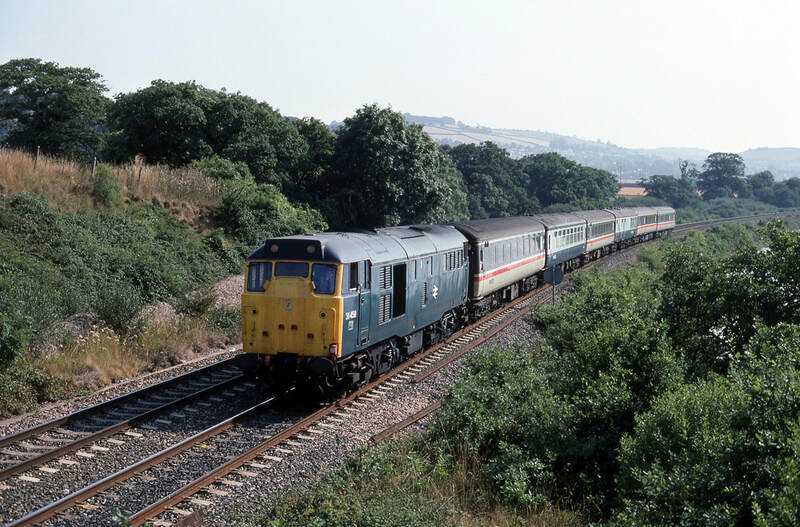 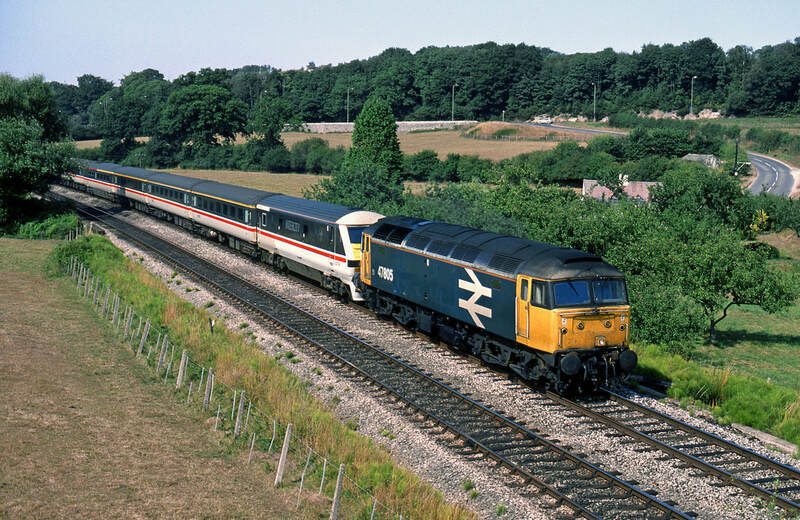 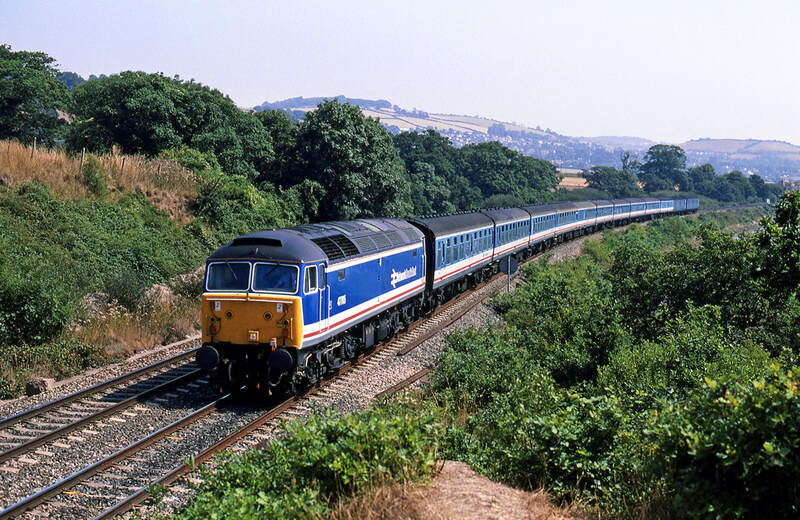 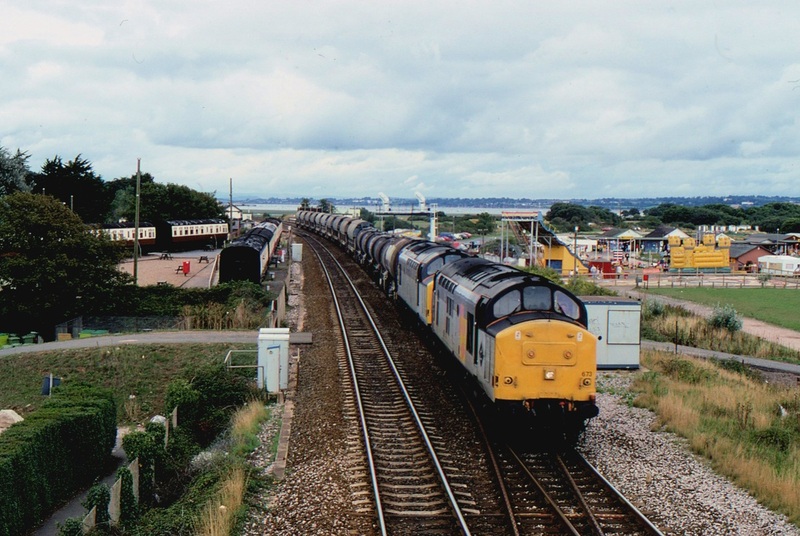 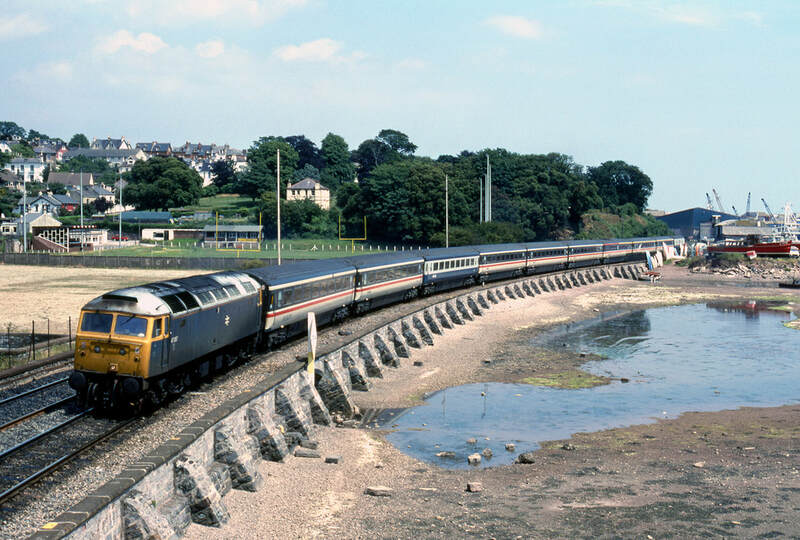 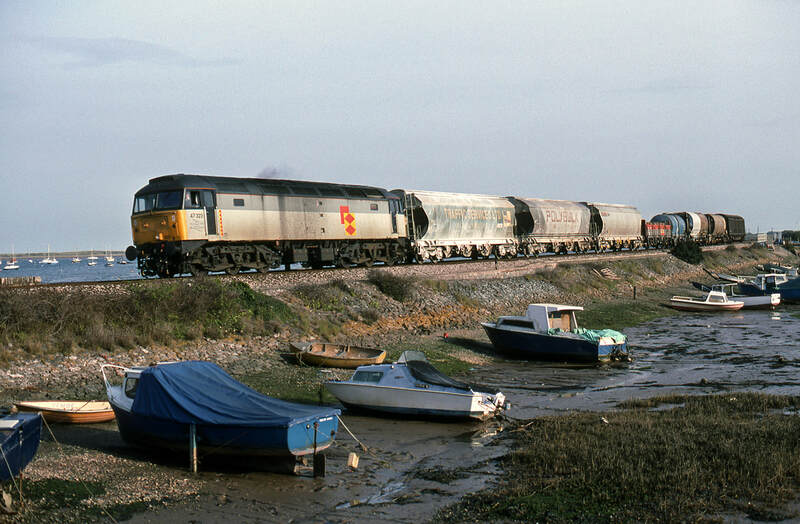 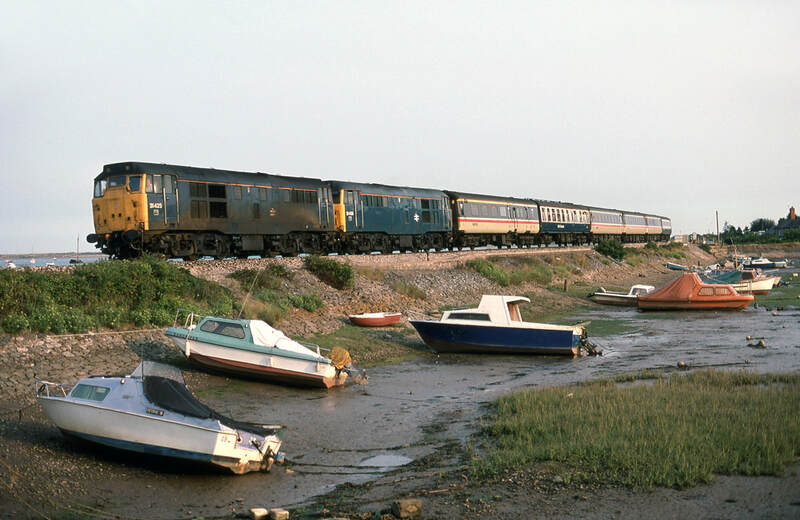 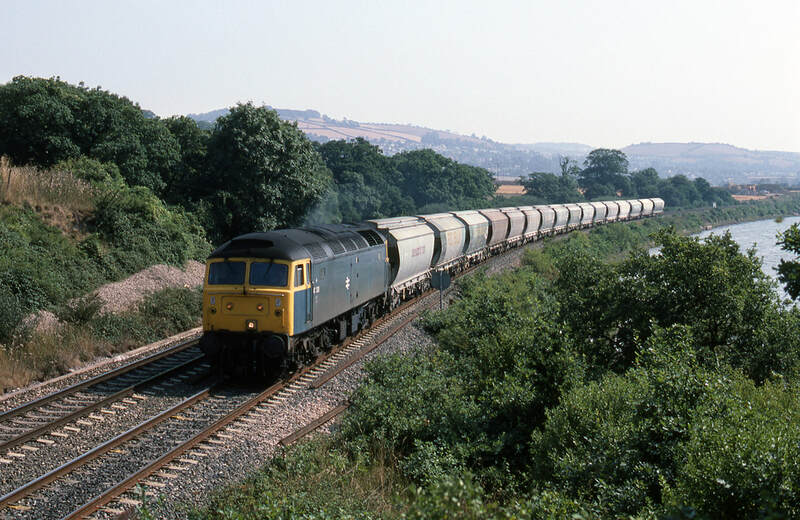 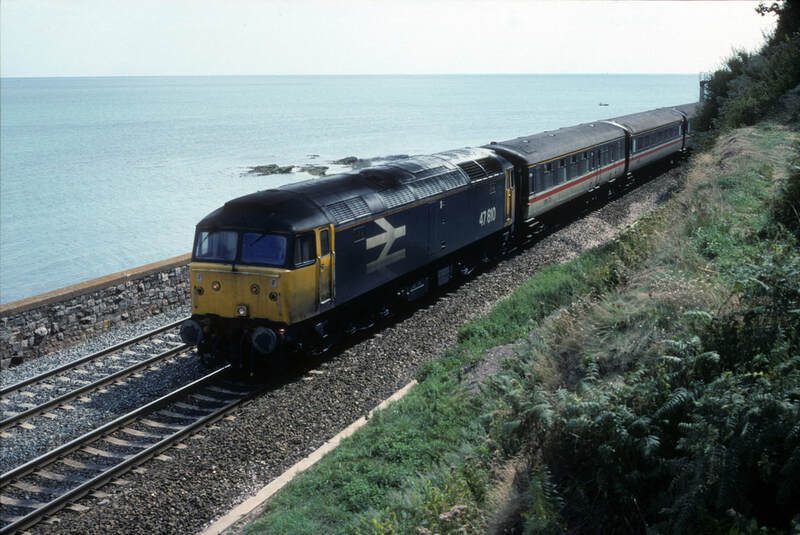 47805 at Kingskerswell with the 1V48 1025 Saturdays Only Liverpool to Paignton 5th August 1989 Copyright Ron Kosys. 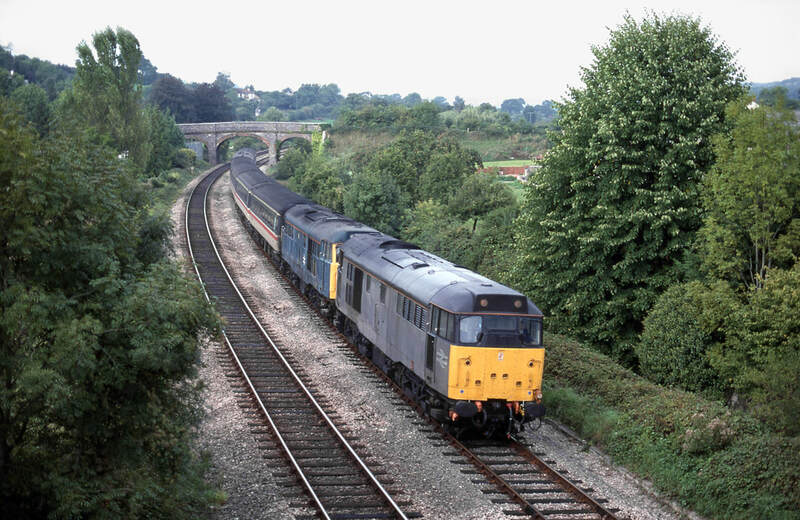 Remember the DVT's? 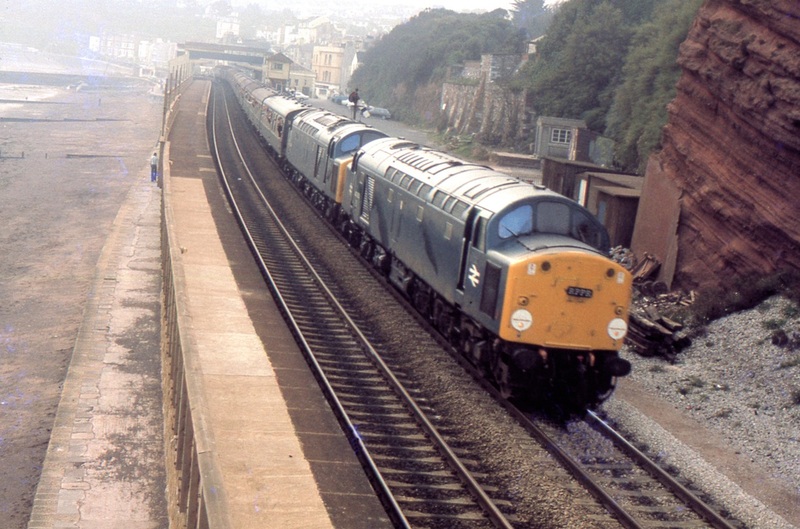 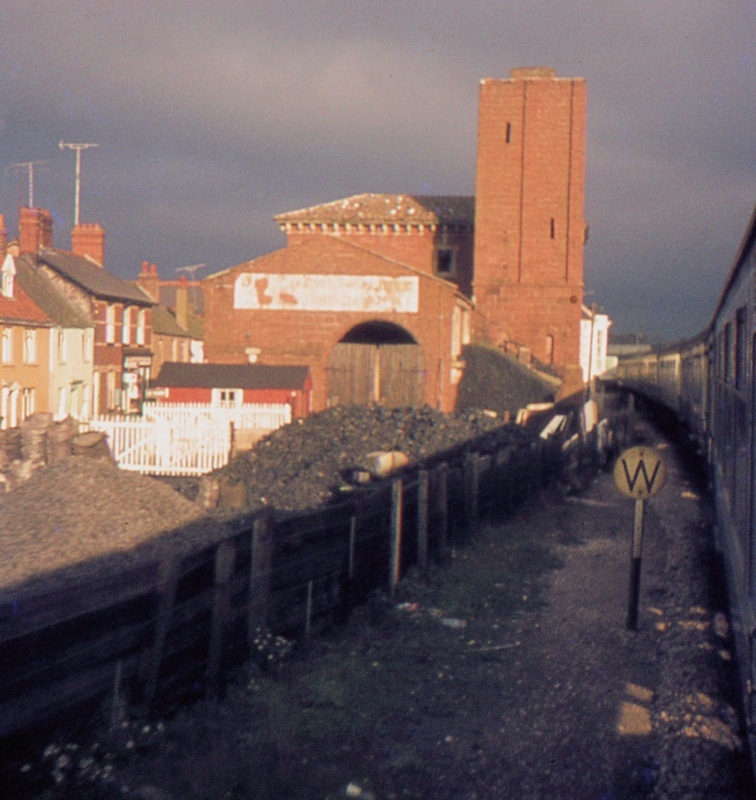 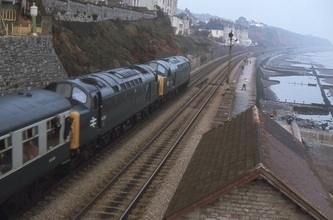 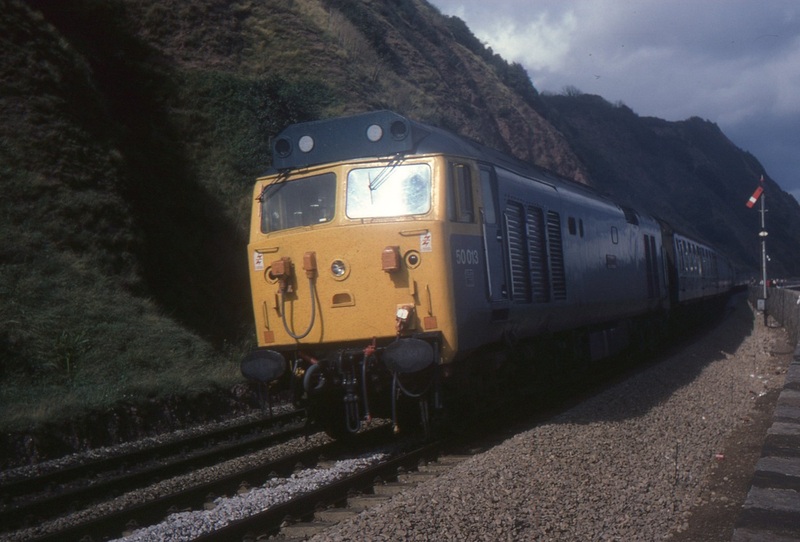 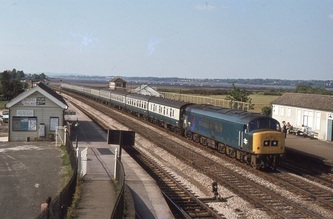 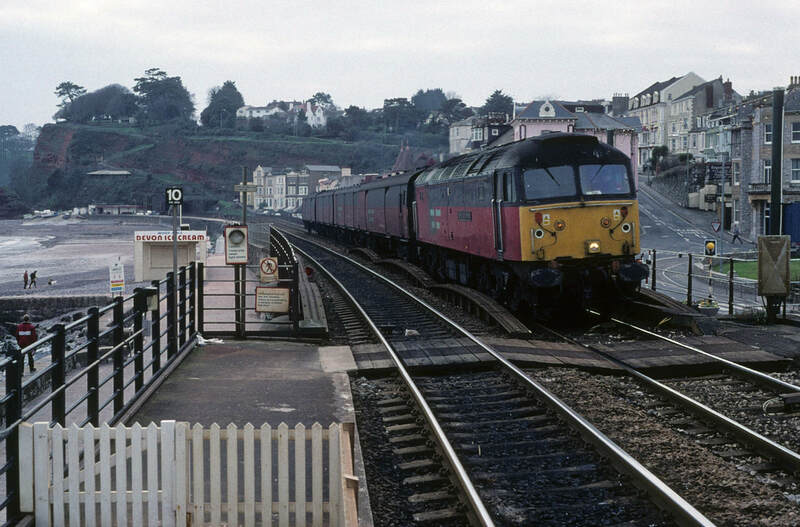 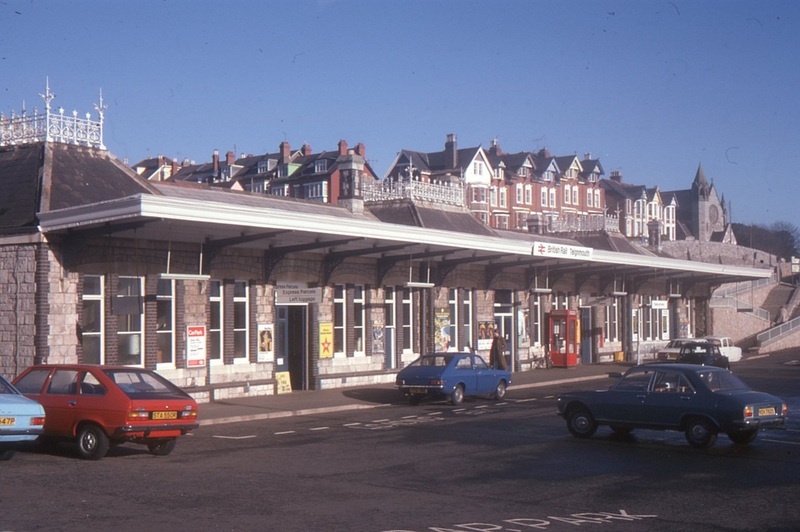 Teignmouth station from the road bridge 50025 Invincible calls with a down service on the 25th November 1978 Copyright Mike Roach. 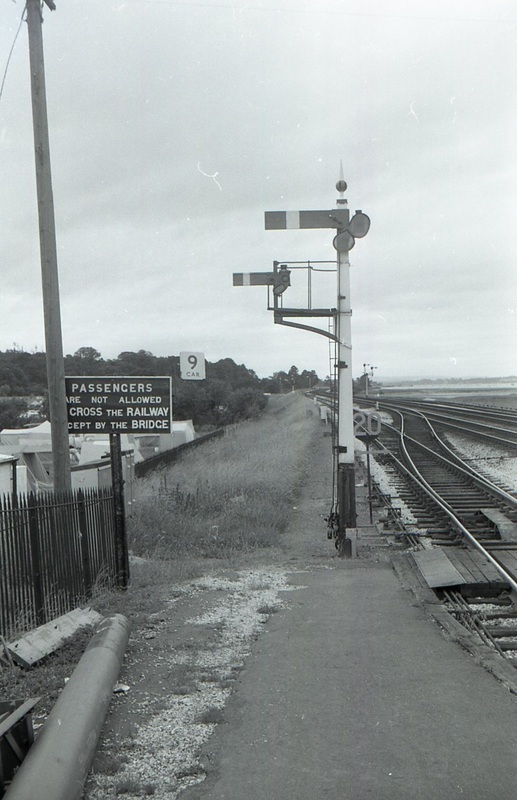 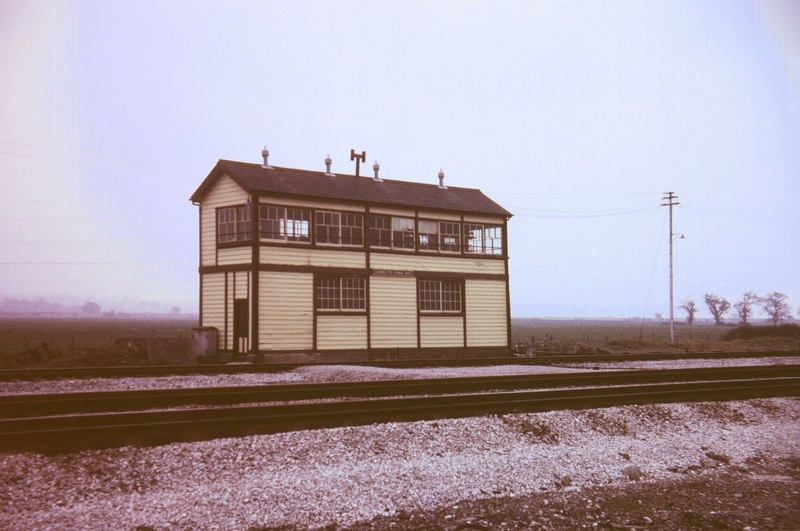 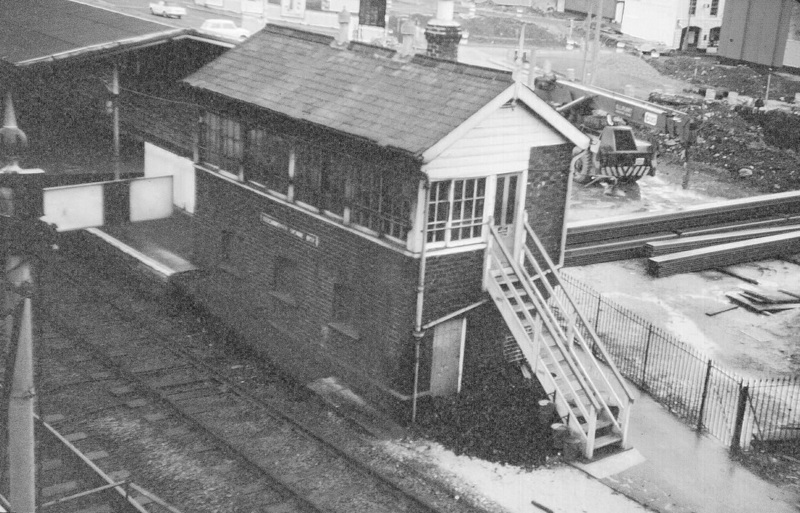 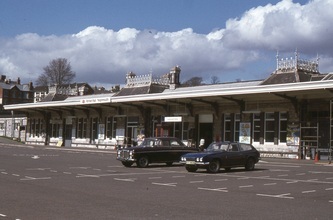 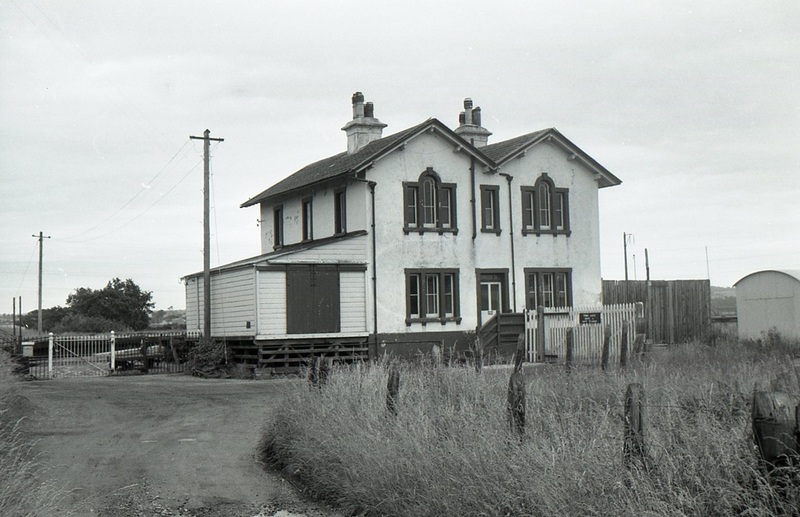 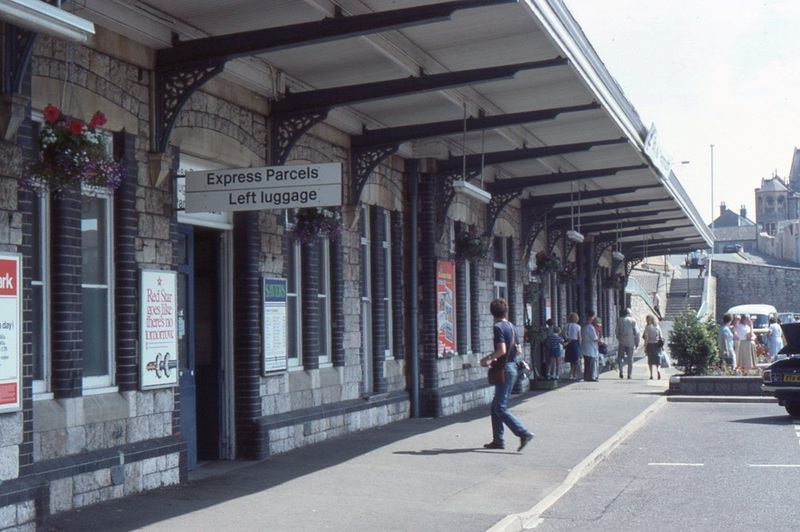 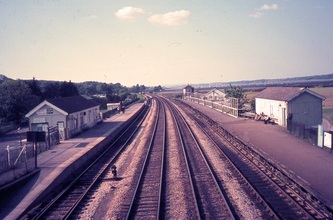 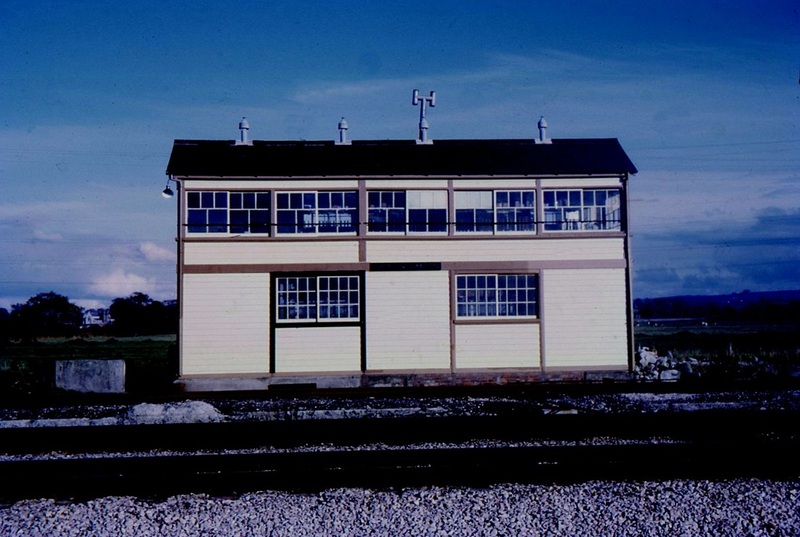 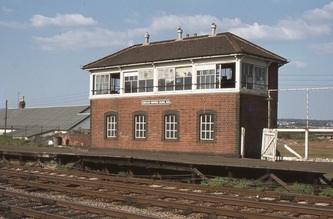 Note the signal box is still in use. 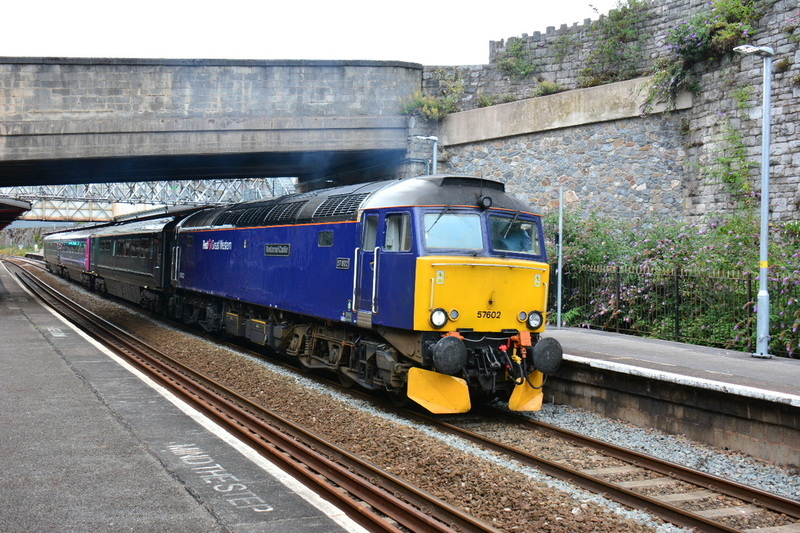 57 602 heads the up Summer Saturday working from Plymouth to Exeter using the day stock of the sleeper train. 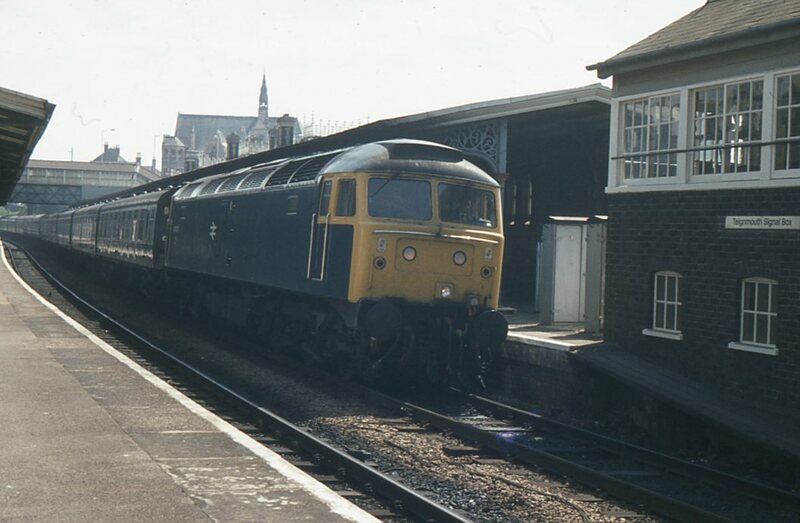 Note the introduction of the new GW Green livery. 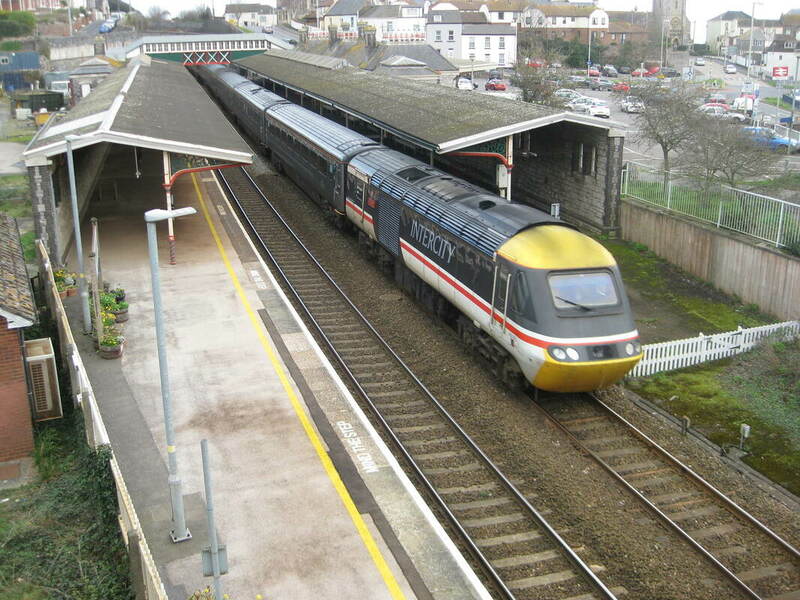 When we've got used to the garish colours of the FGW blue one wonders how long this will last. 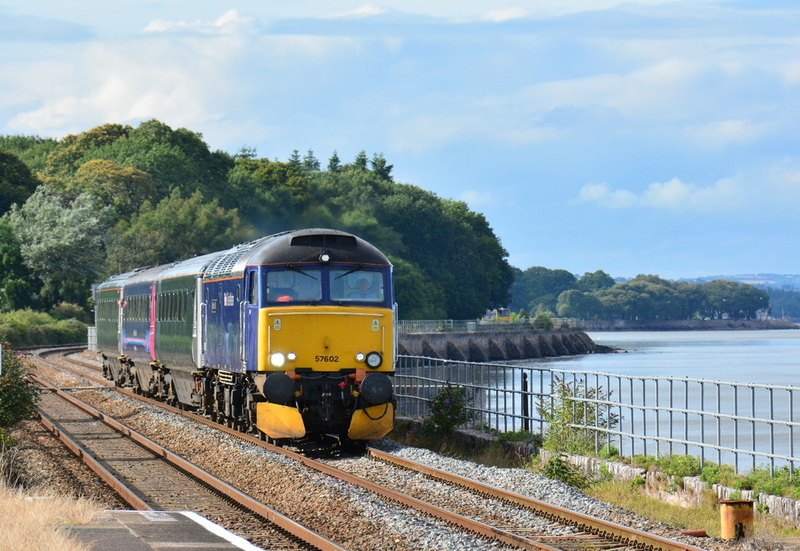 1st August 2015 Copyright Steve Widdowson. 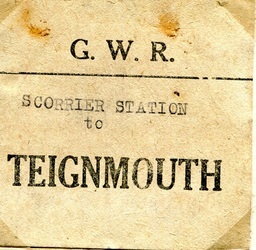 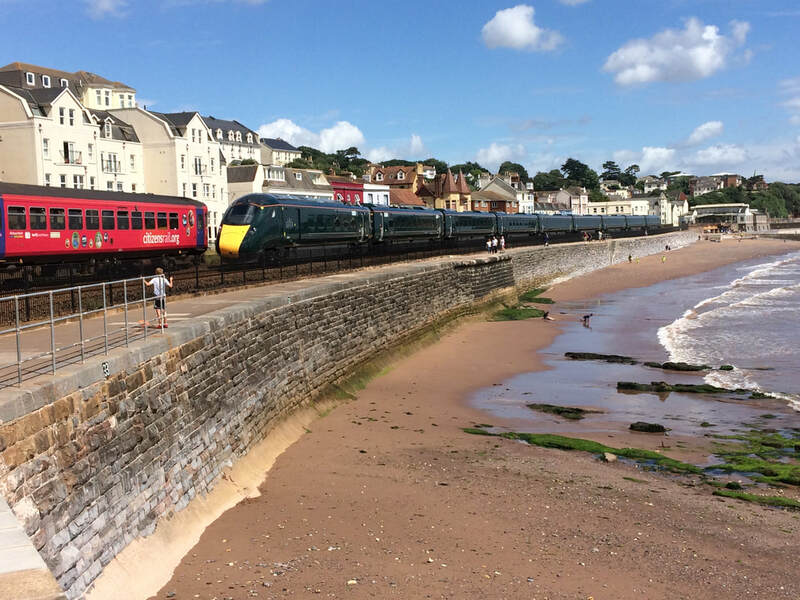 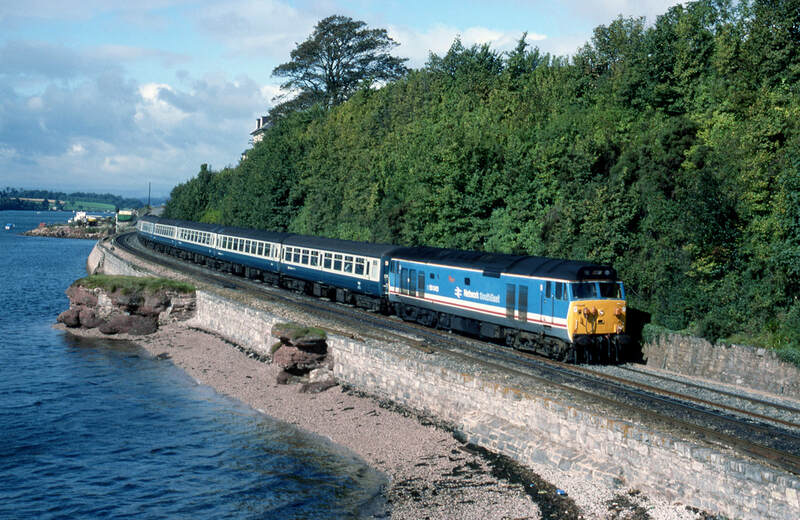 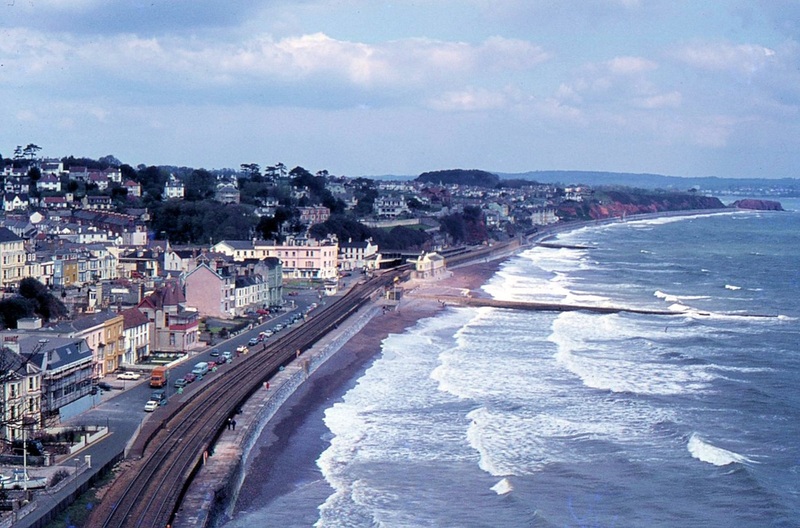 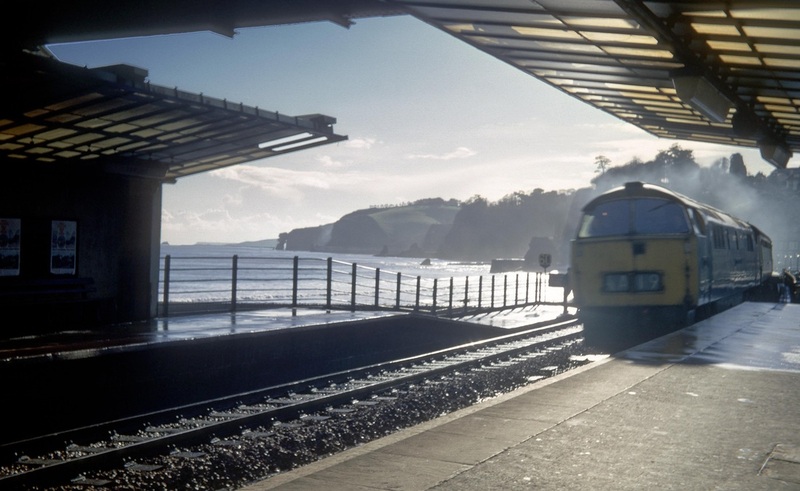 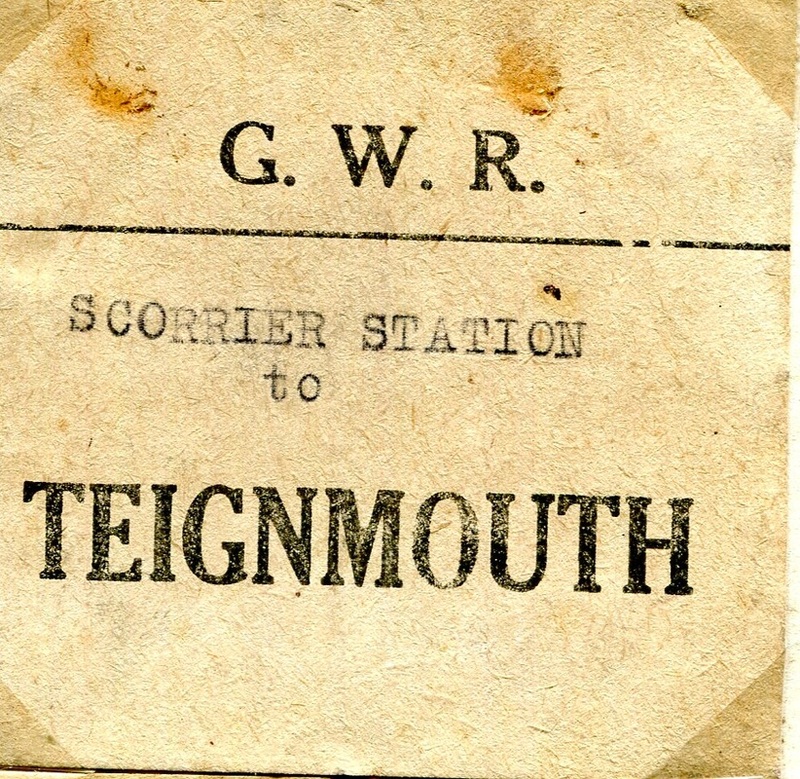 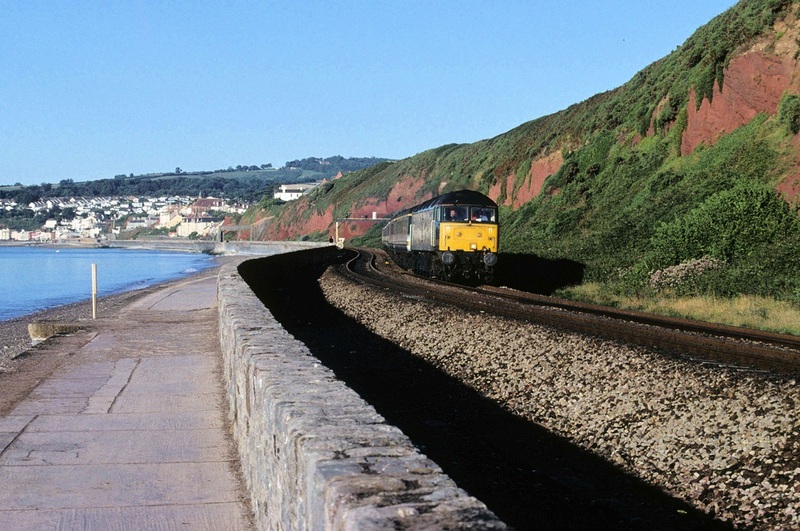 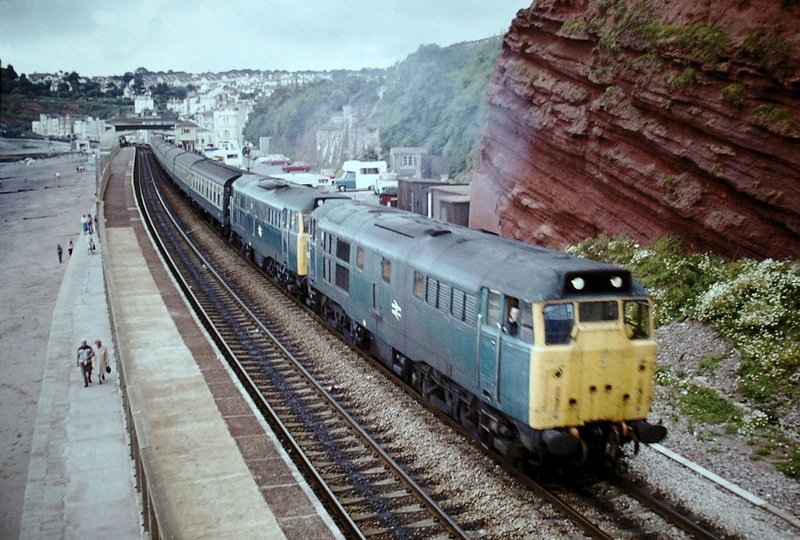 Teignmouth to Dawlish In November 2016, a proposal been 'floated' concerning works on the Teignmouth - Dawlish stretch. 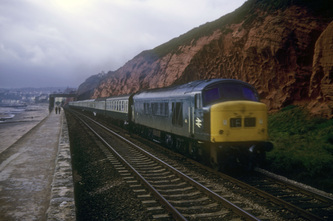 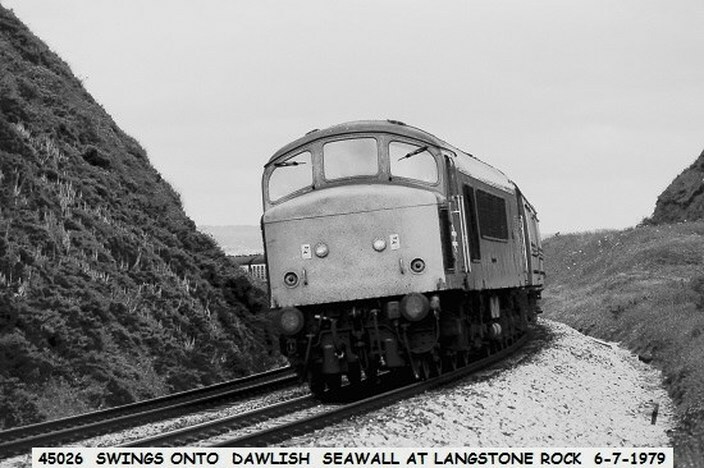 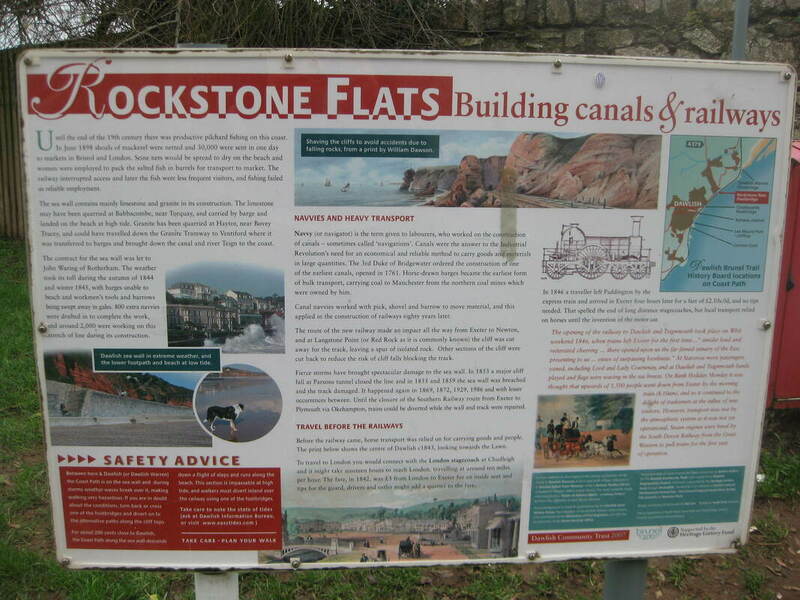 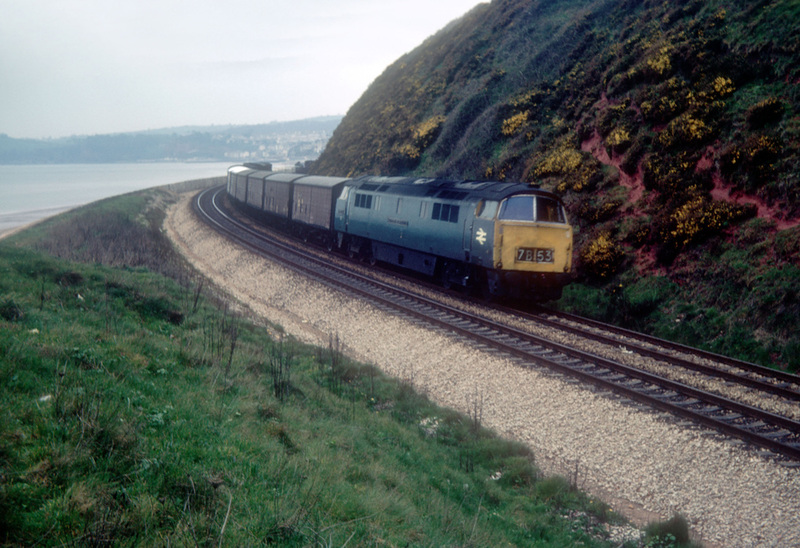 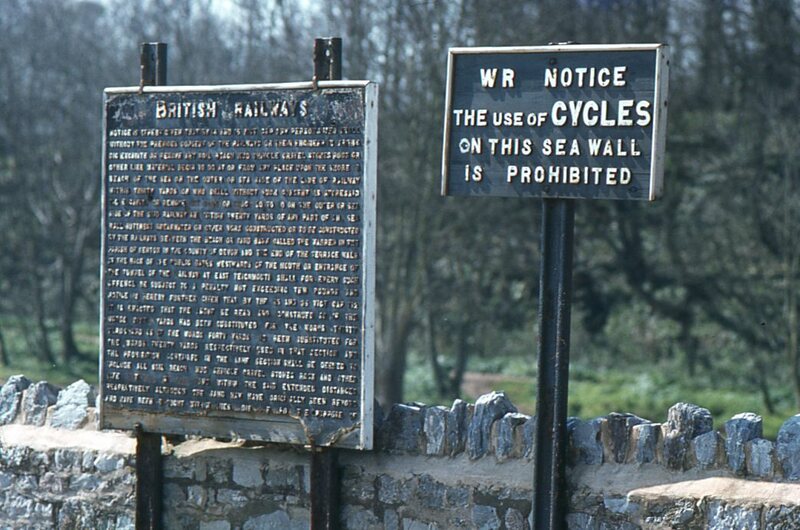 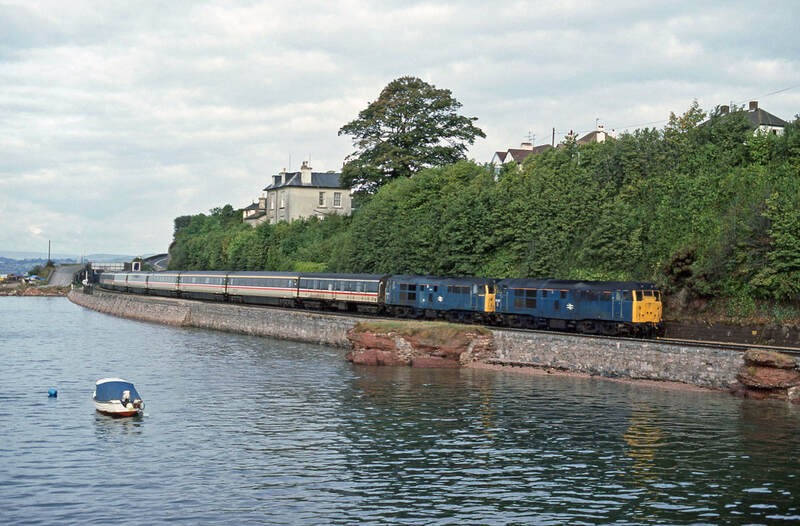 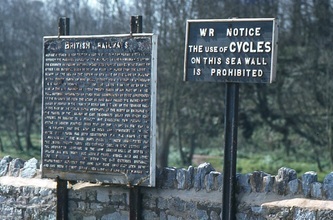 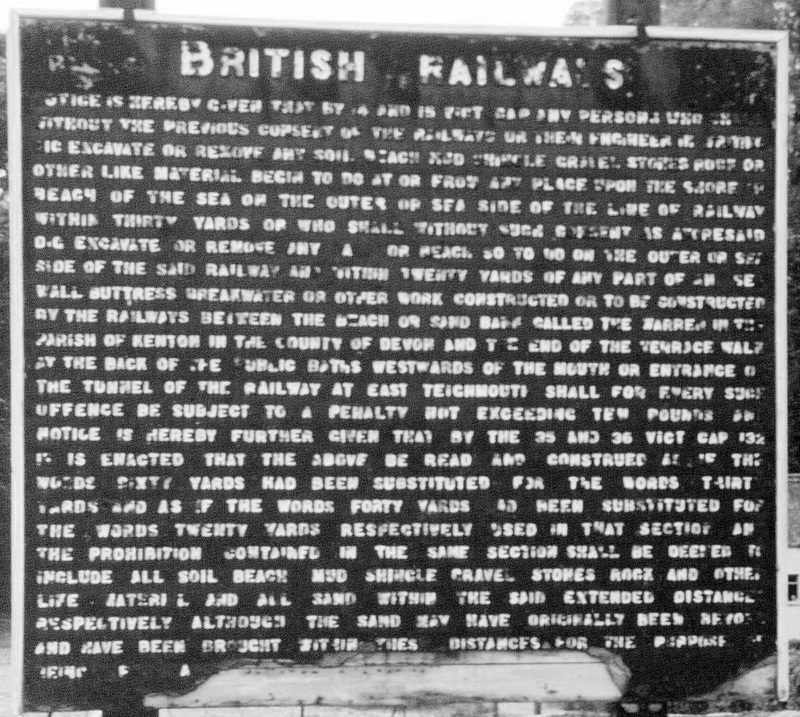 Many thanks to Derek Buttivant for the following which clarifies matters :- My understanding is that Dawlish would be unaffected by the NR proposal because the viaduct section is between Teignmouth and Parson's Tunnel only, with a viaduct constructed some 30 metres seaward of the existing wall, passing outside the promontory of Sprey Point and then re-joining the existing route to pass through the five tunnels. 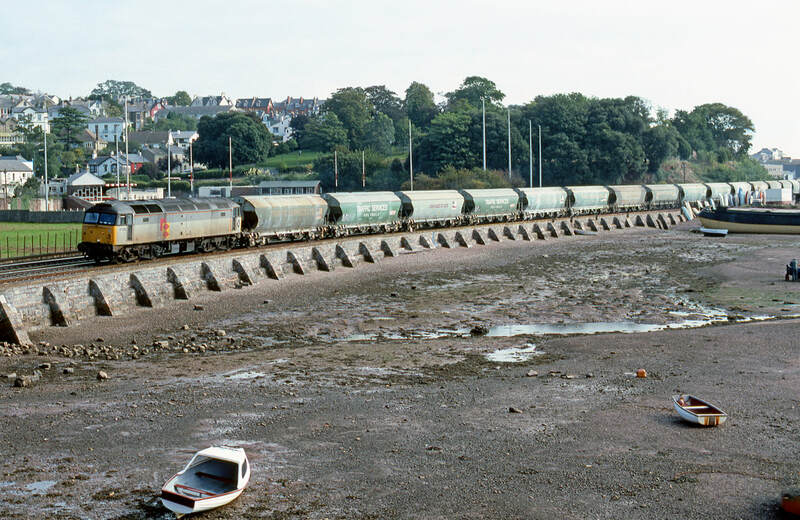 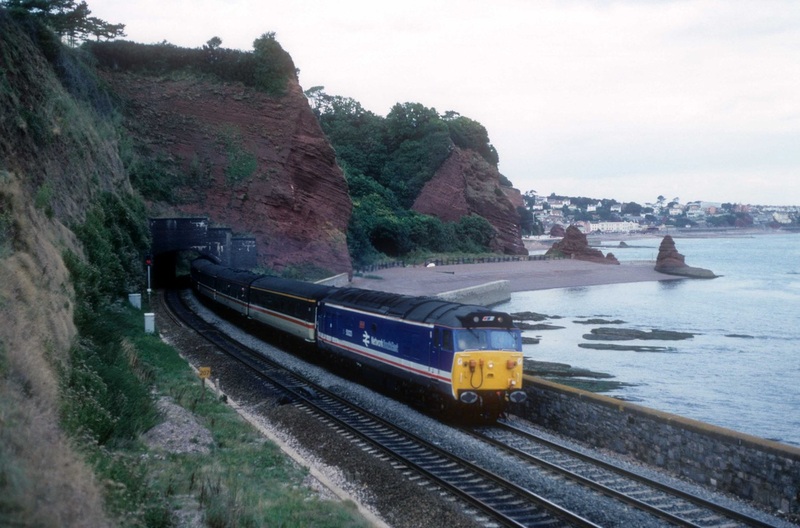 I imagine that there might be an outcry from Teignmouth residents about the plan but there could be an even bigger outcry if the spectacular red headlands through which the tunnels are cut were to be "defaced" with a concrete viaduct passing seaward of them. 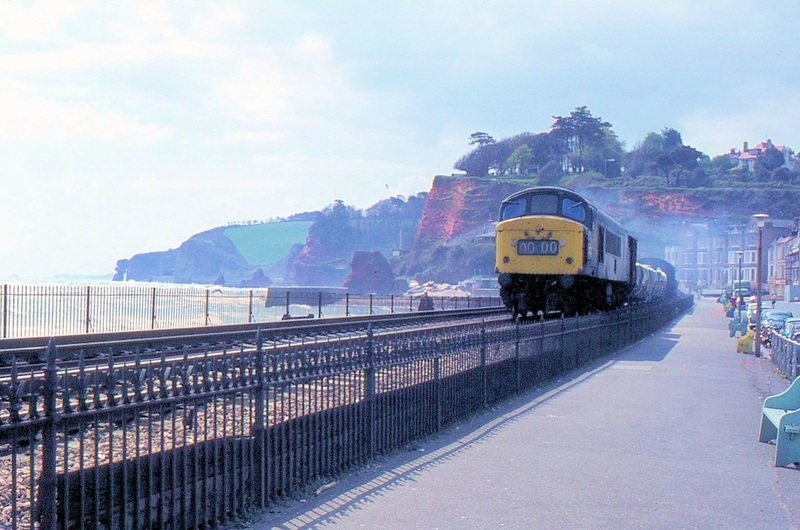 I understand, too, that the concern at the Teignmouth end of the sea wall is with the unstable nature of the cliff face rather than with the wall itself, so moving the line away from the cliff would be a way of avoiding cliff falls on that stretch. 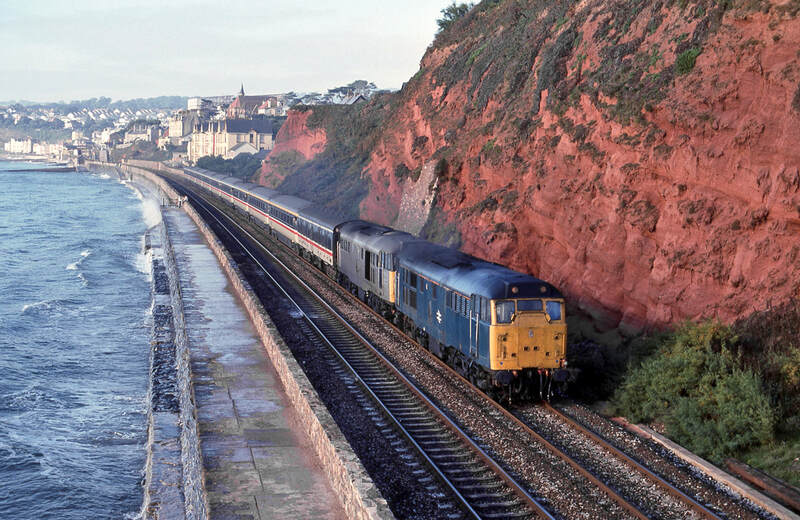 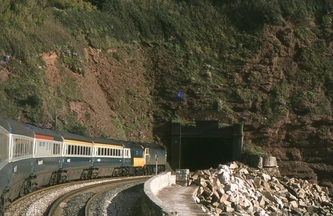 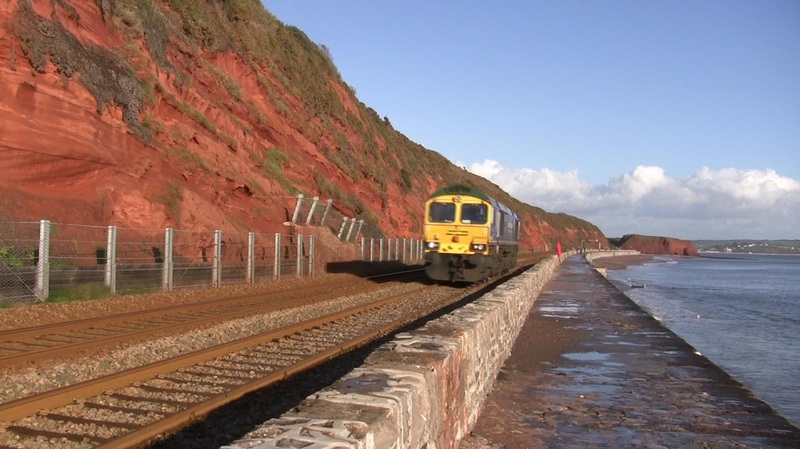 On the other hand, the section through the tunnels is clearly not vulnerable in the same way either from the sea or from unstable cliffs and between Dawlish station and Langstone rock the new red sandstone cliffs are somewhat stronger than at the Teignmouth end. 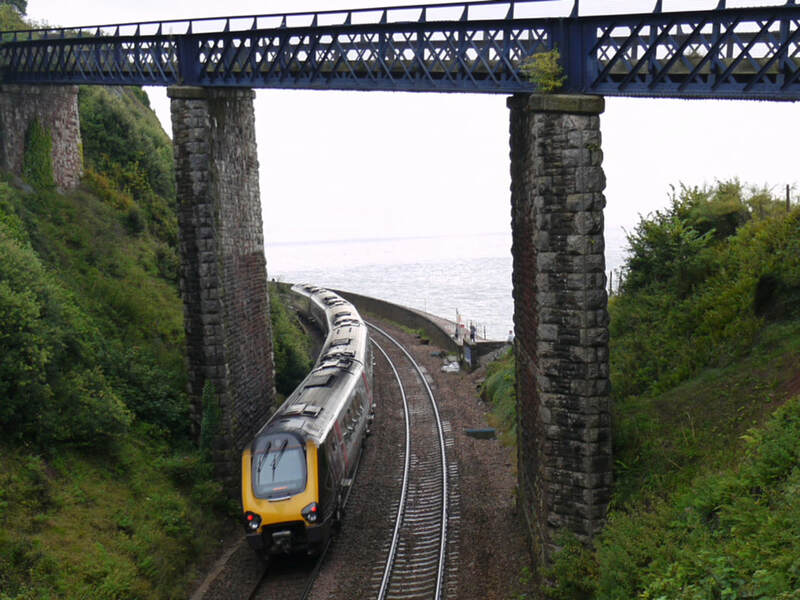 Of course, the viaduct idea is just one of several being examined and I think there's a degree of "kite flying" to find out how strong public feeling might be. 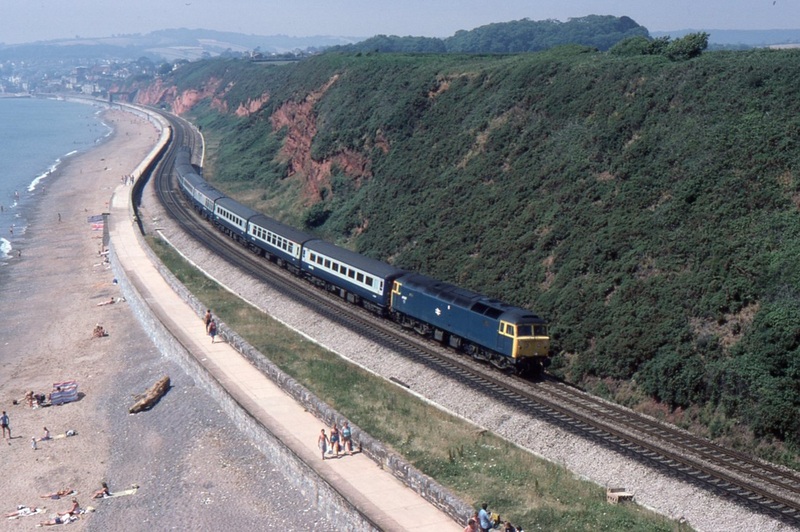 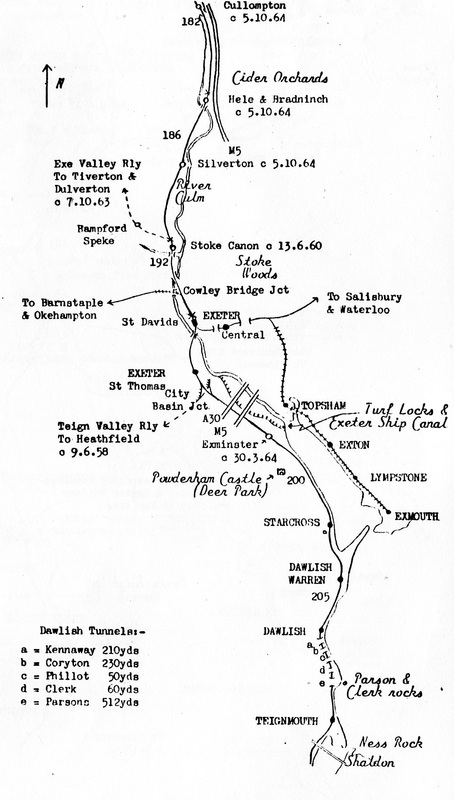 Compared with the best likely alternative (inland via two tunnels behind Dawlish and Teignmouth) the viaduct scheme would be significantly cheaper. 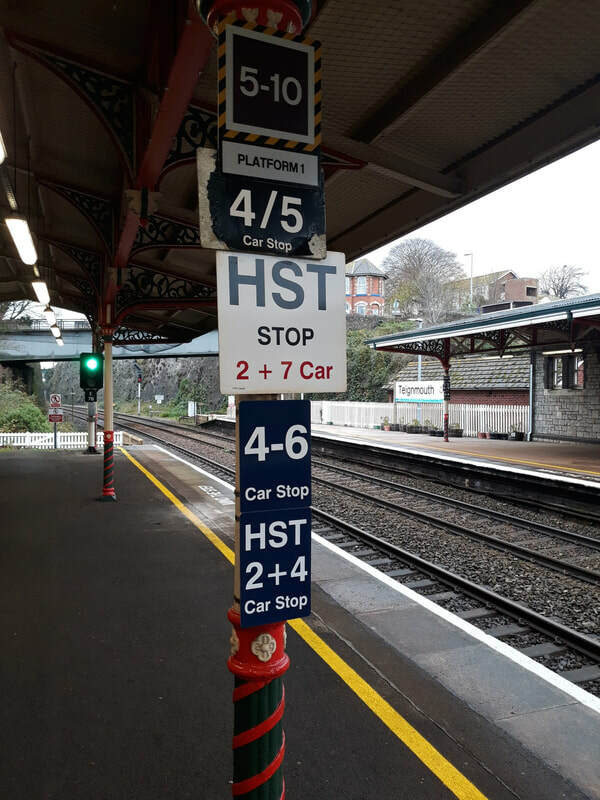 Many thanks to you Derek for this input. 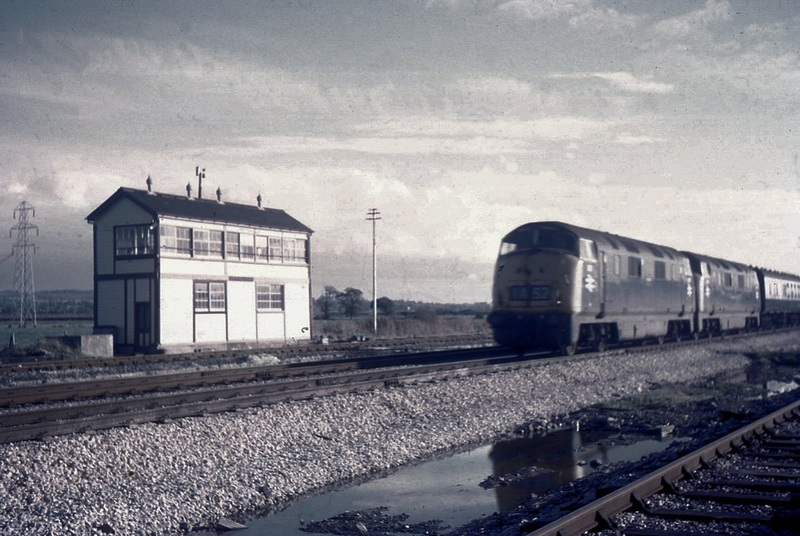 ​Mike says :- It isn't often that I wax lyrical about a going-away shot but I fell in love with this one even before I scanned the glass negative as it shrieked "quality". 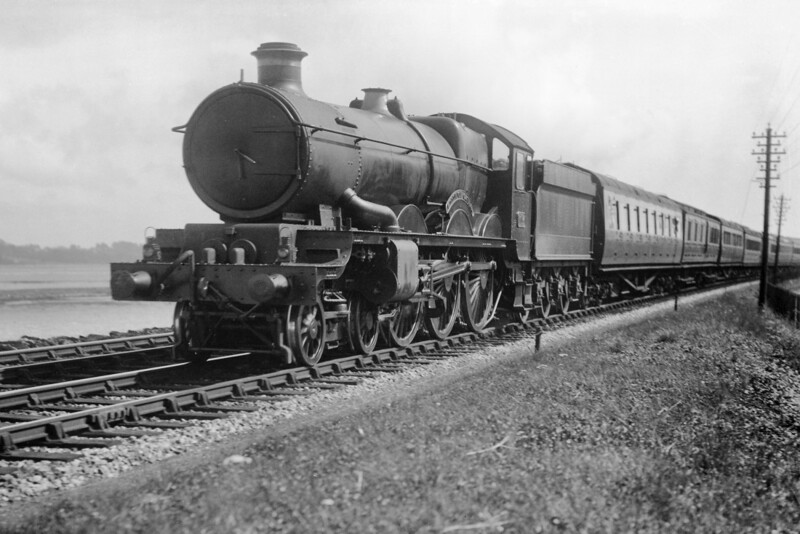 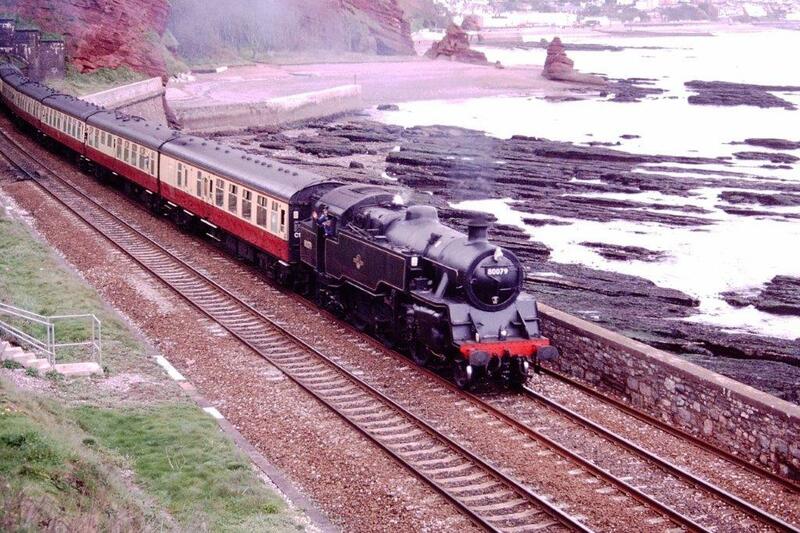 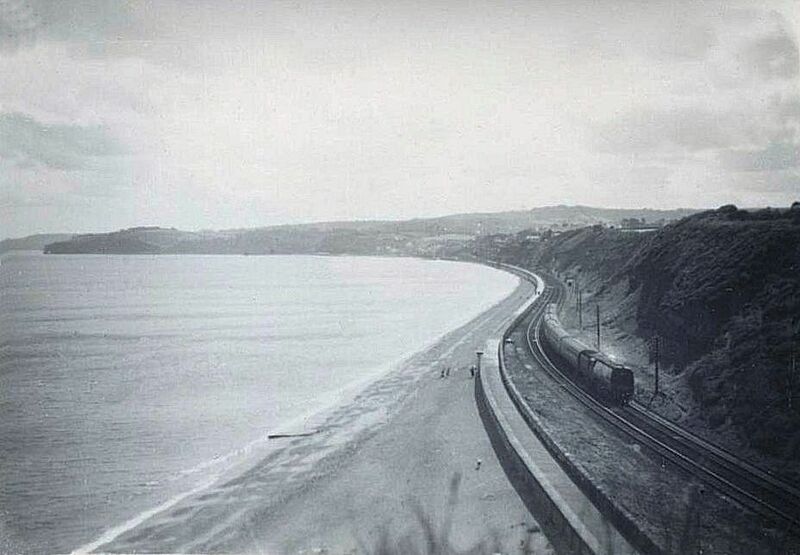 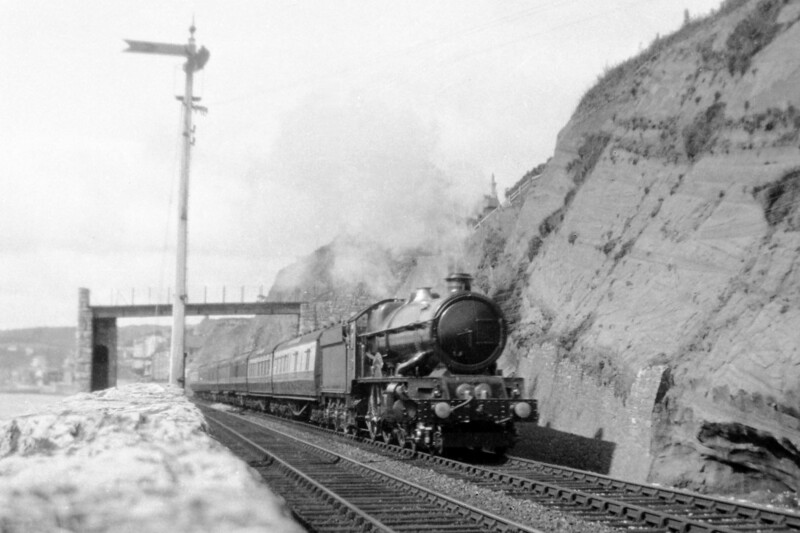 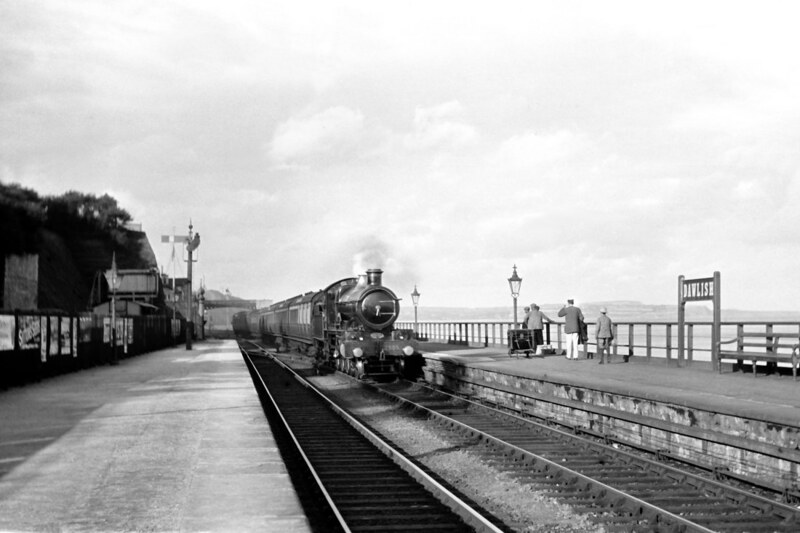 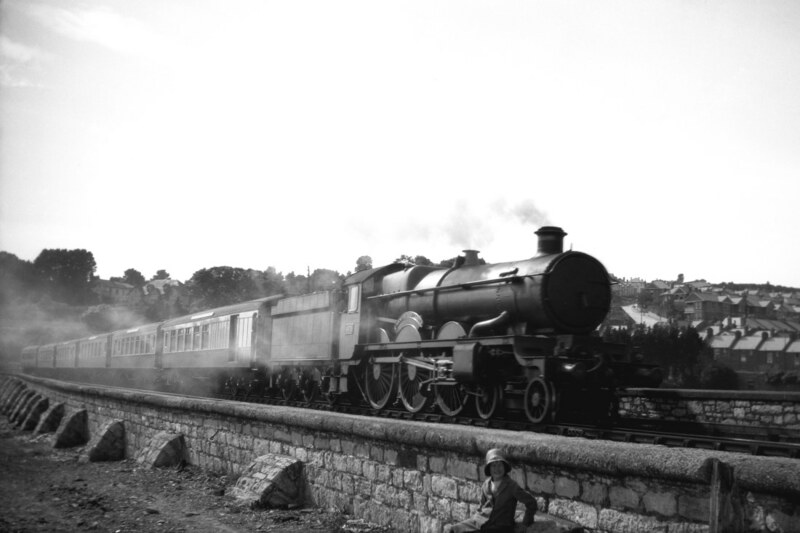 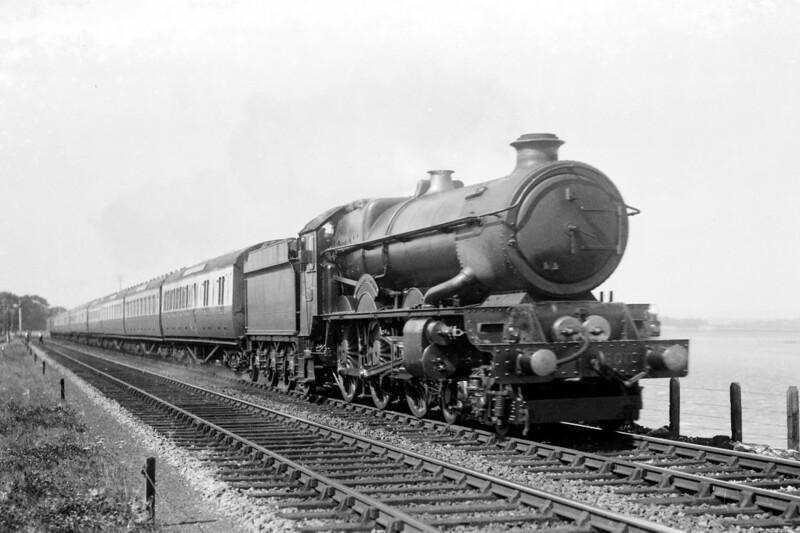 This is Dawlish allegedly in 1929 and the star of the show is Churchwood Saint class 4-6-0 No. 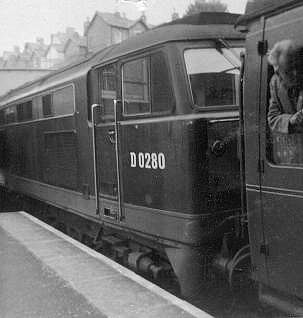 2904 Lady Godiva fresh out of shops and about to depart in the direction of Exeter. 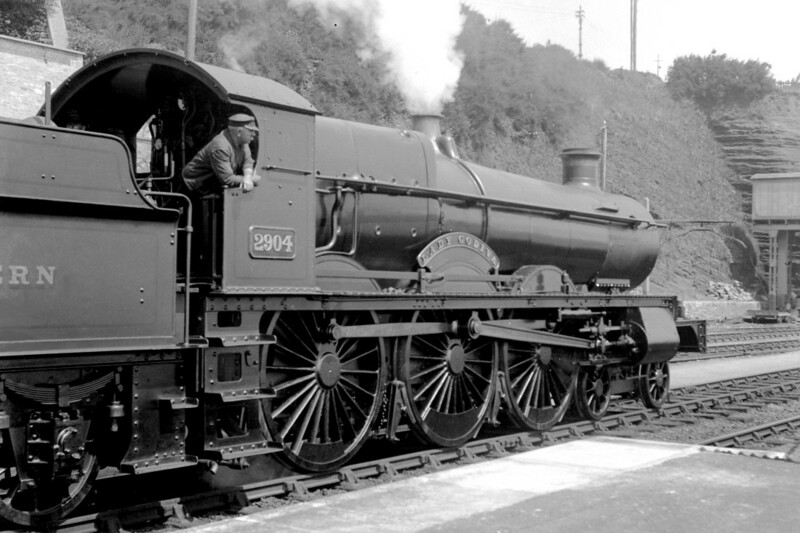 That overhaul wouldn't spare her ladyship the ignominy of withdrawal from service only three years later in 1932 after only 26 years in service. 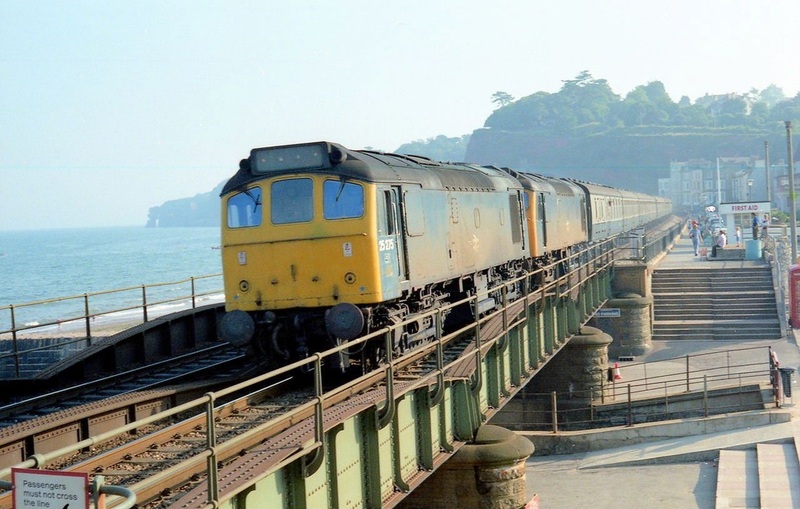 66626 takes it easy along the Dawlish Sea Wall on the 16th December 2011 Copyright David Tozer. This stretch is particularly noted for its red cliffs. 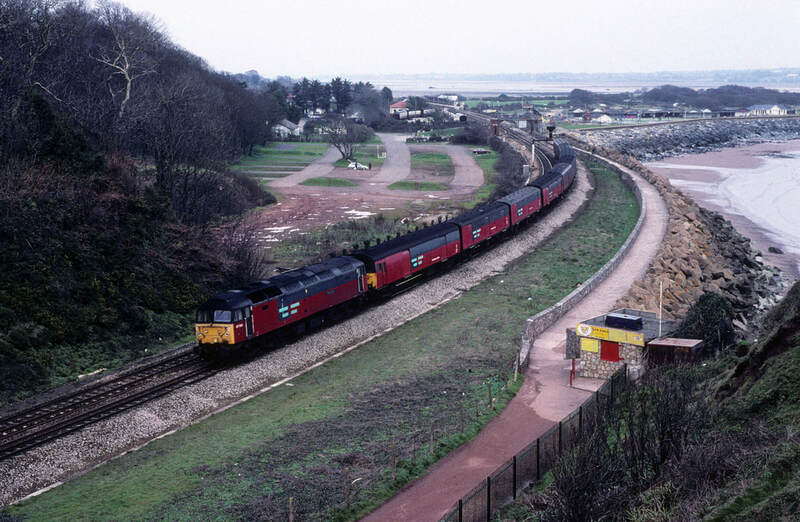 Dawlish Warren 47768 heads 5c99 the Bristol to Plymouth vans at Dawlish Warren on the 21st January 2000 Copyright Roger Geach N.B. 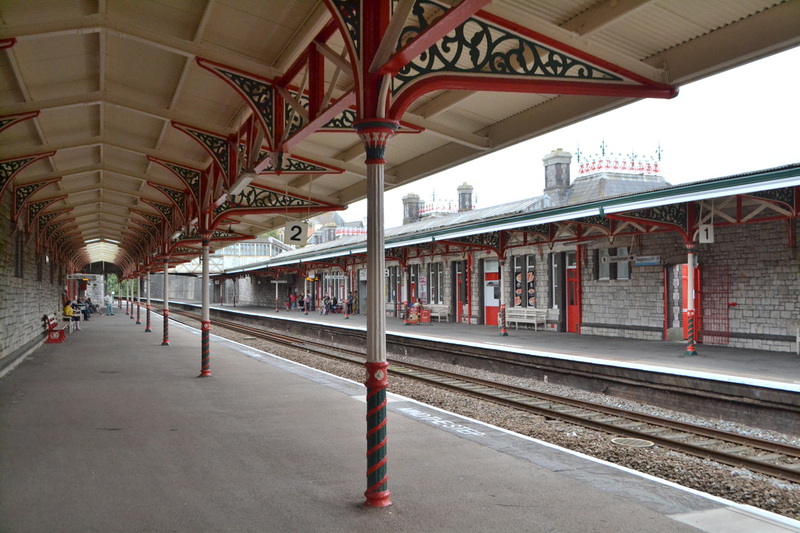 Hardly a person in sight! 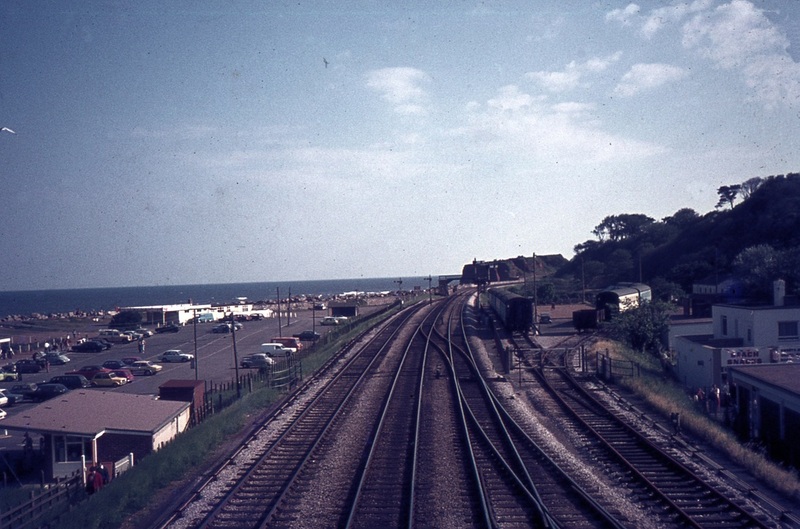 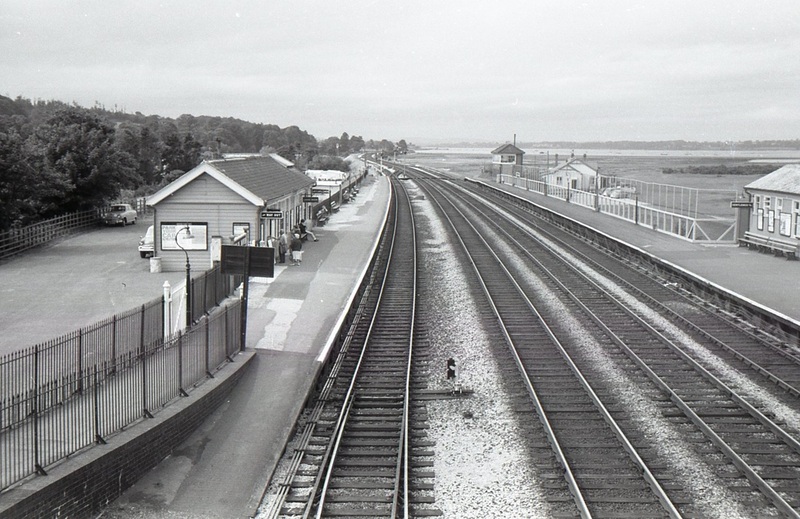 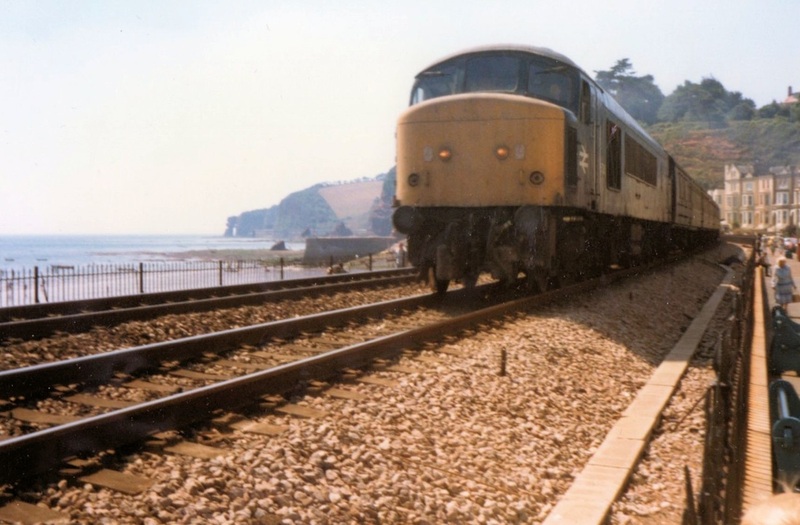 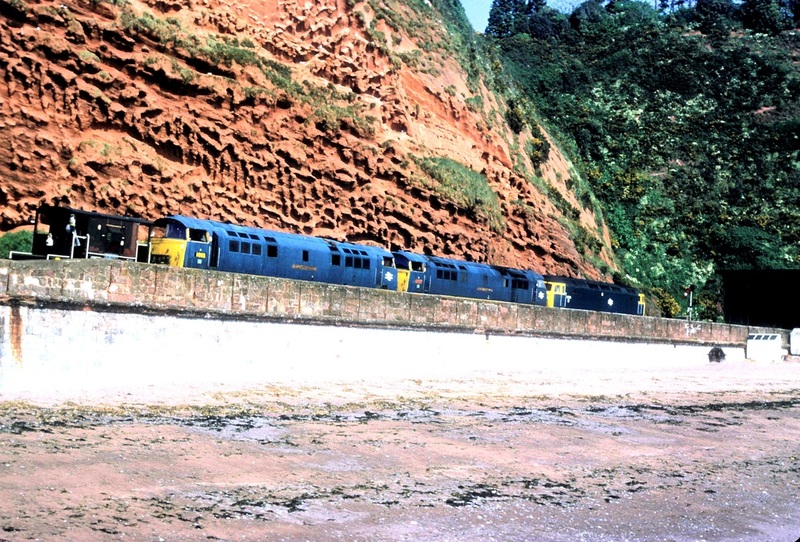 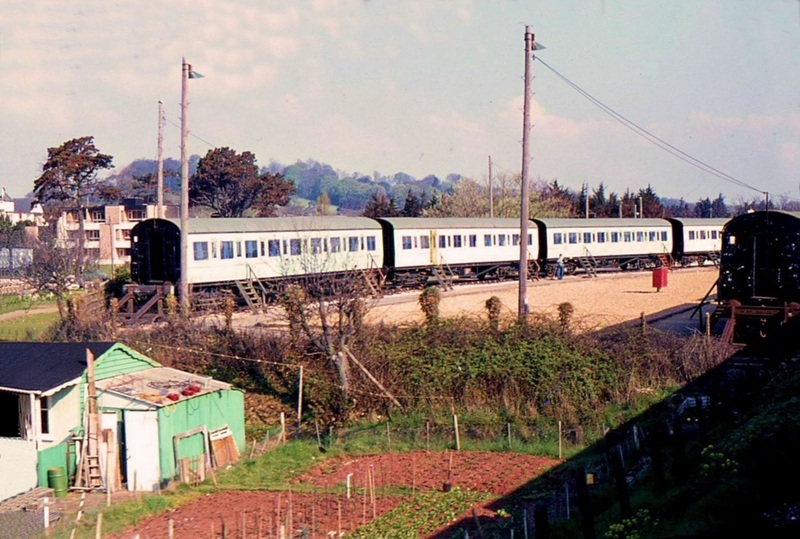 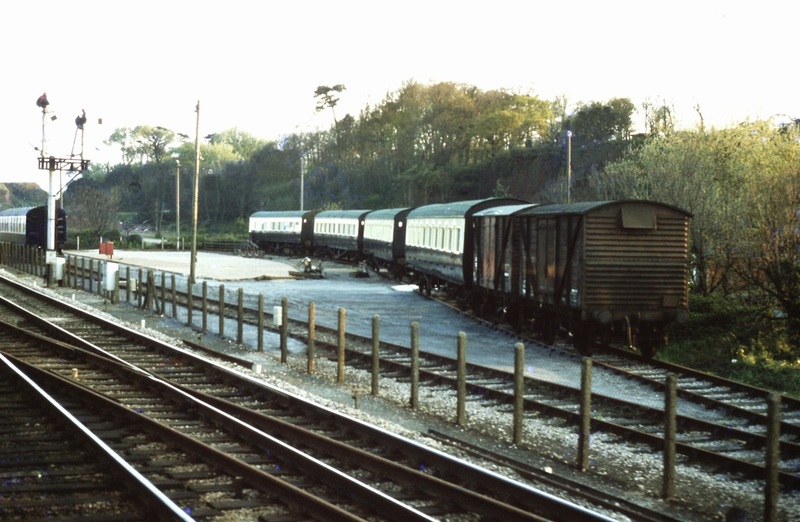 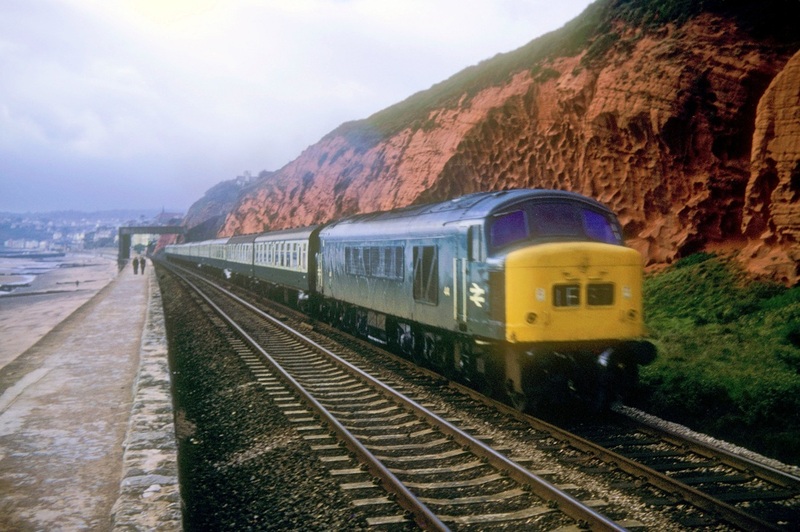 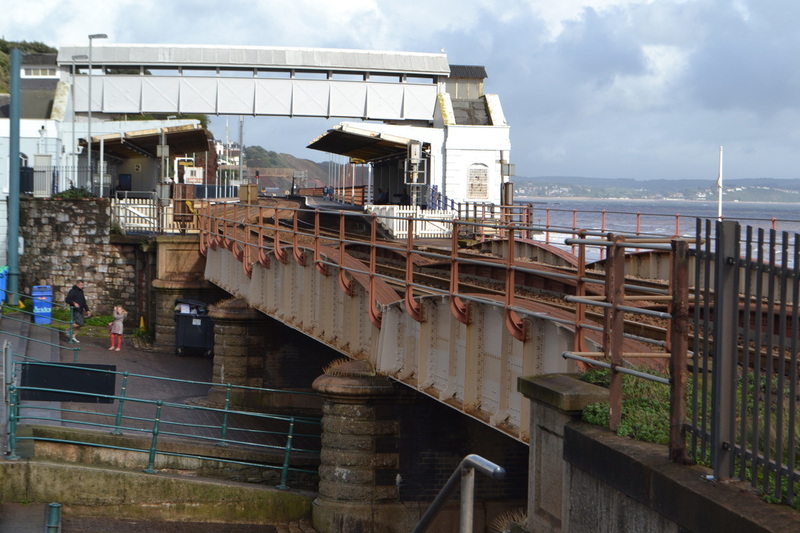 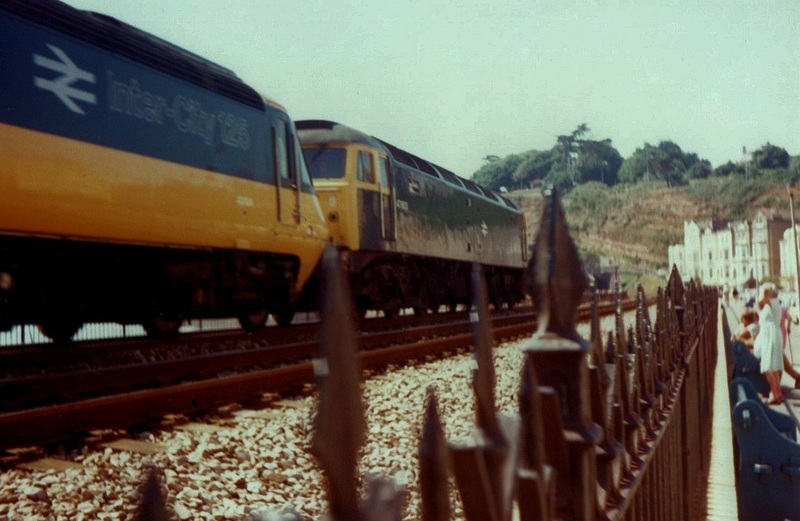 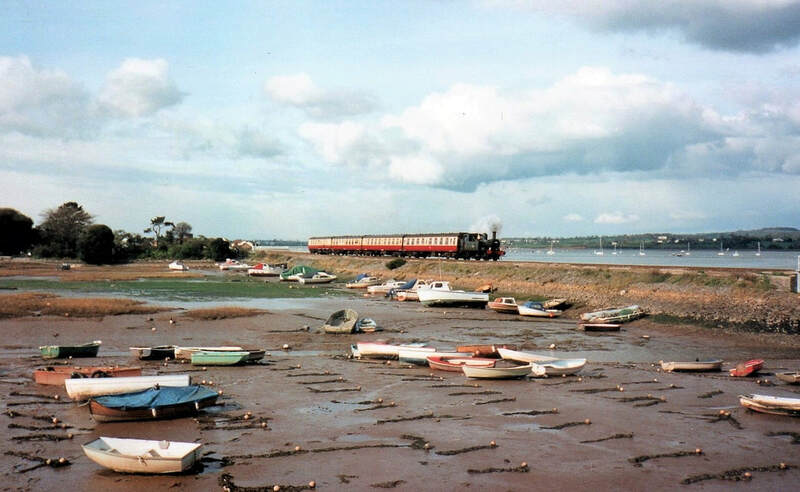 AN iconic railway camp site at Dawlish Warren is to close after rising repair and restoration costs made it financially unviable. 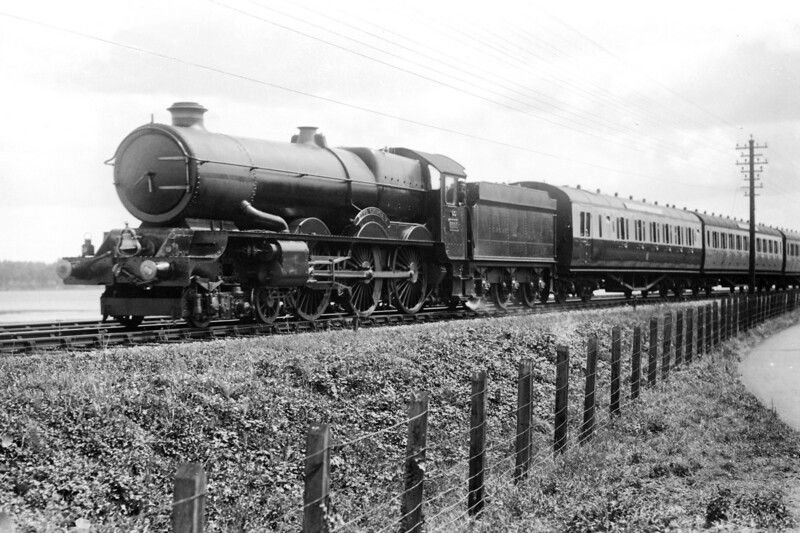 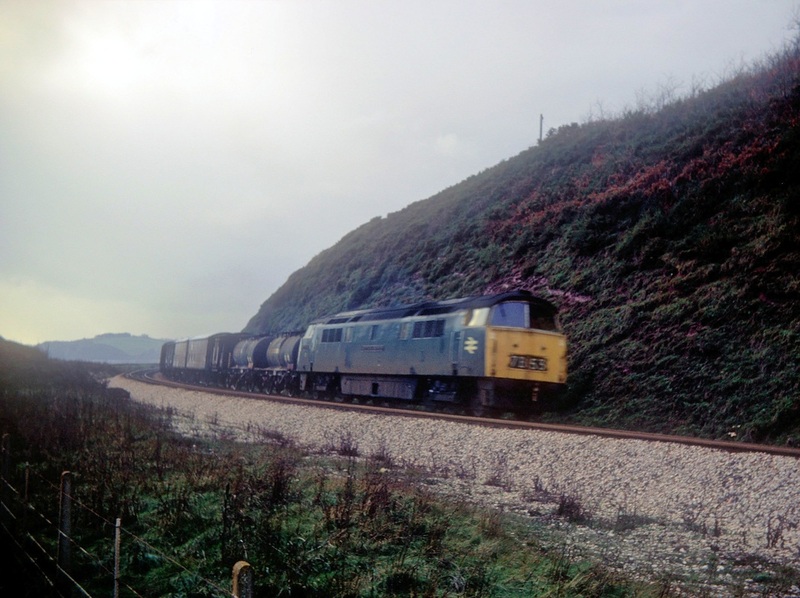 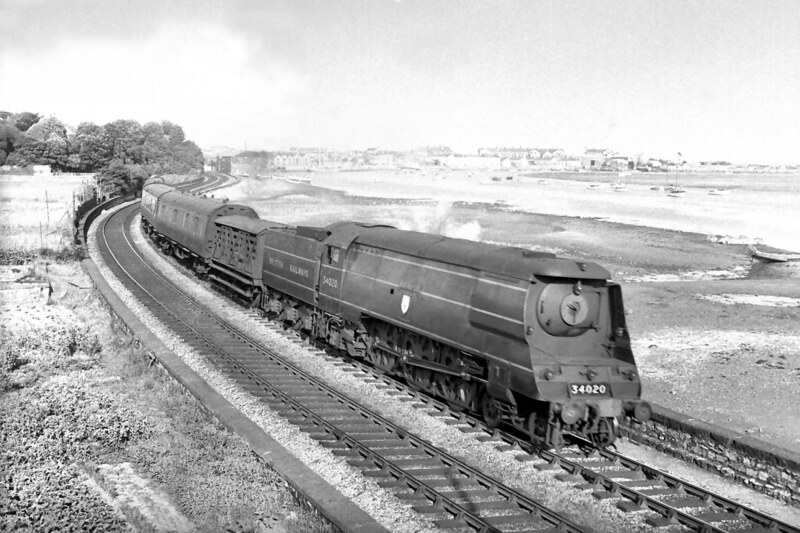 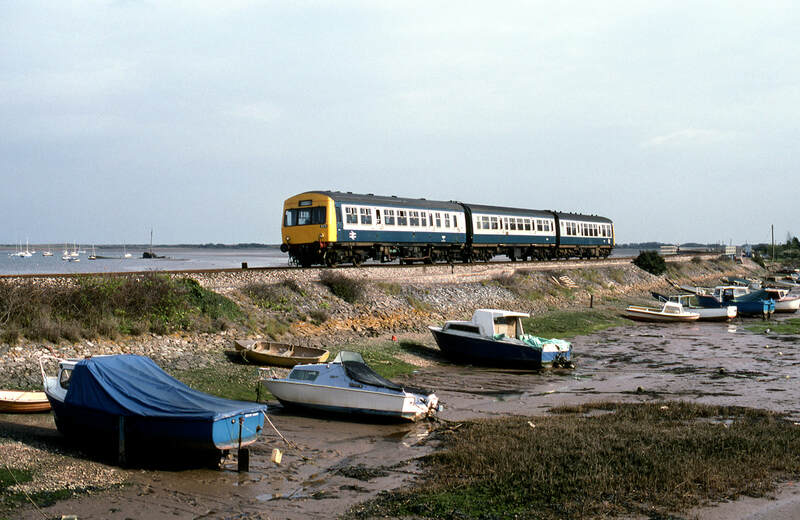 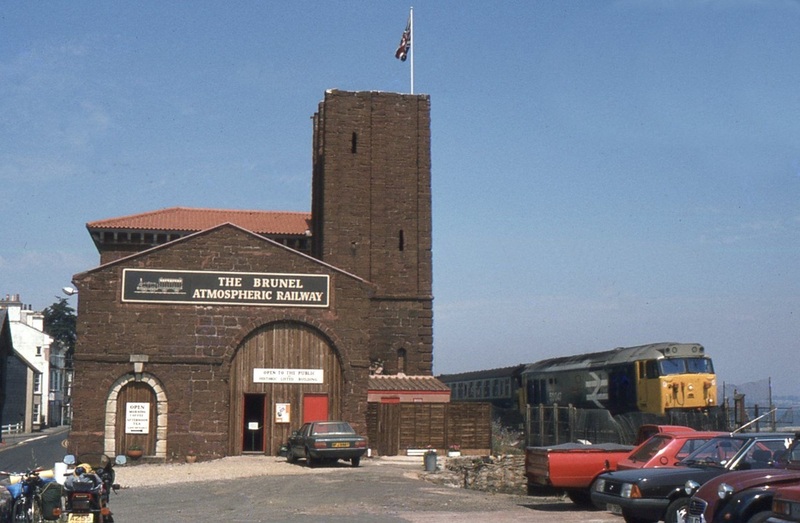 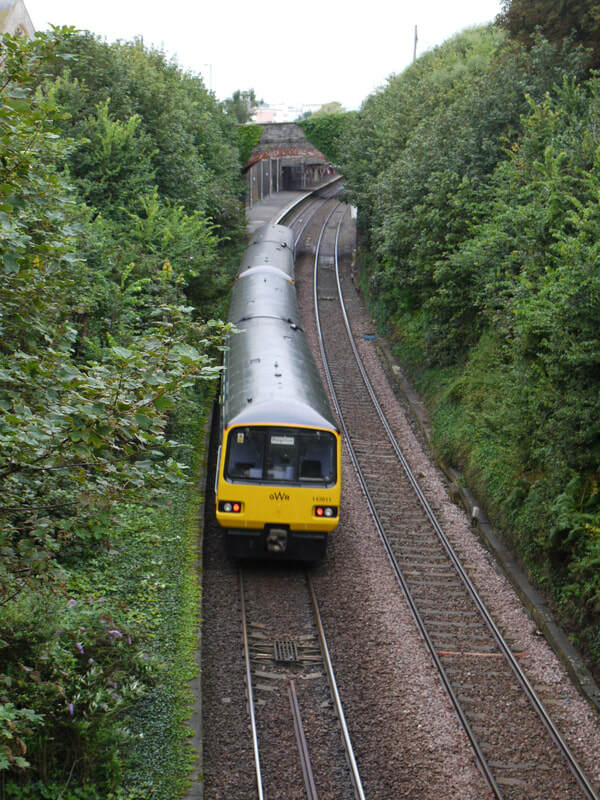 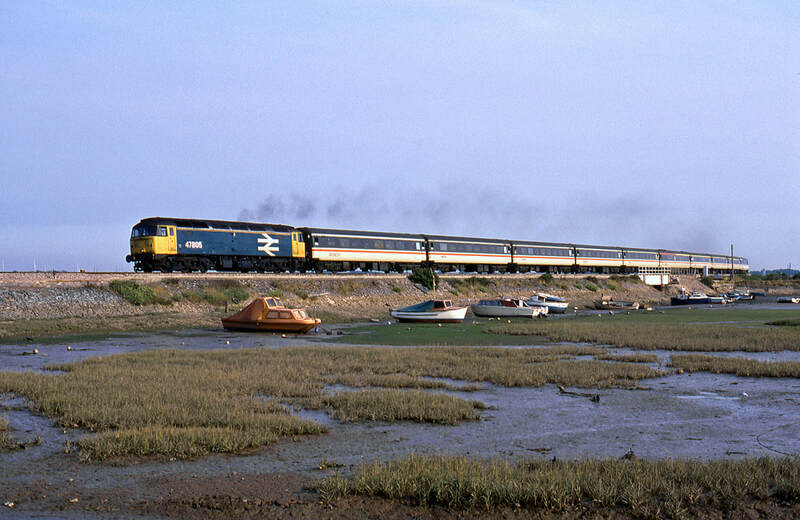 Brunel Railway Camping Park, Beach Road, will open for its last season next summer after more than 50 years. 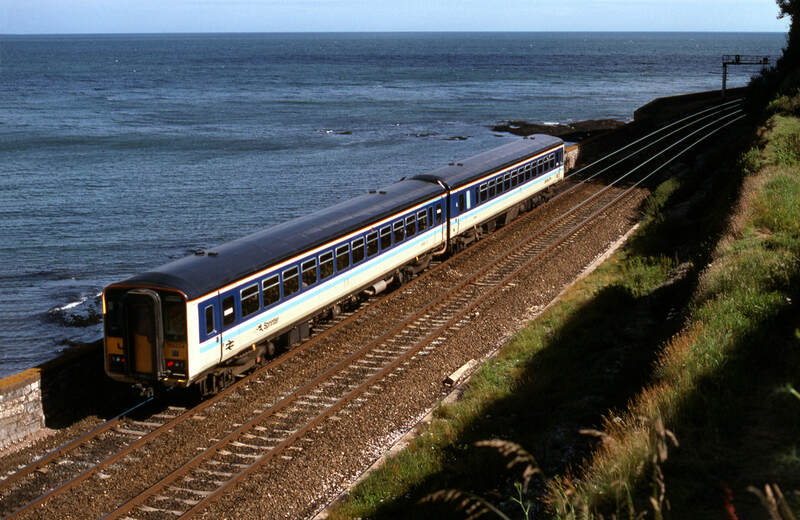 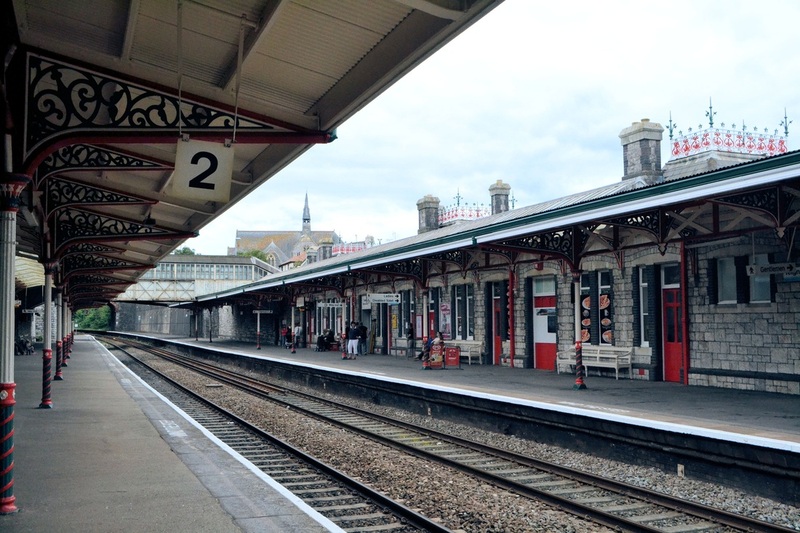 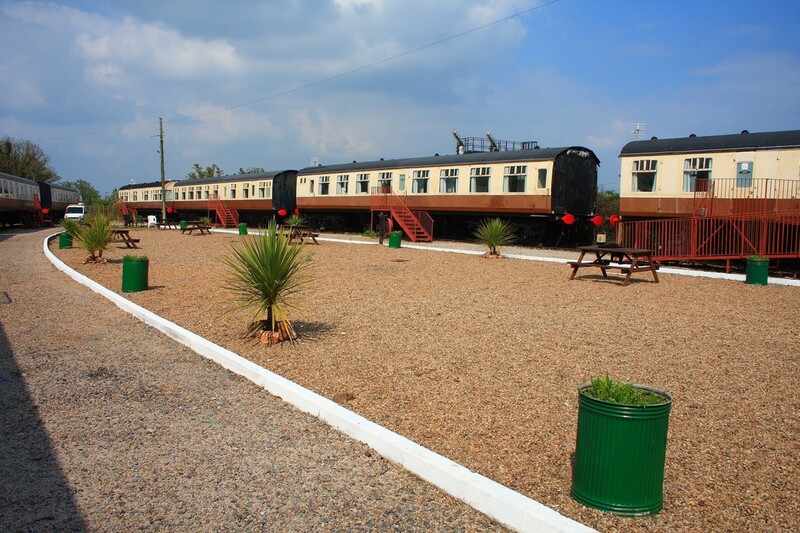 The eight converted railway carriages – with many original features – are run as holiday accommodation by a non-profit making association but although the operation breaks even the coaches are in need of expensive upkeep. 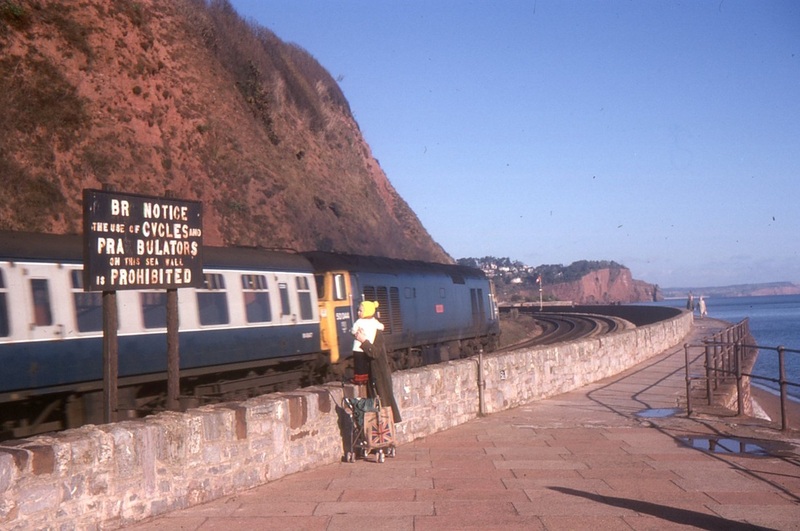 The refurbished camping coaches on the former goods yard at Dawlish Warren station. 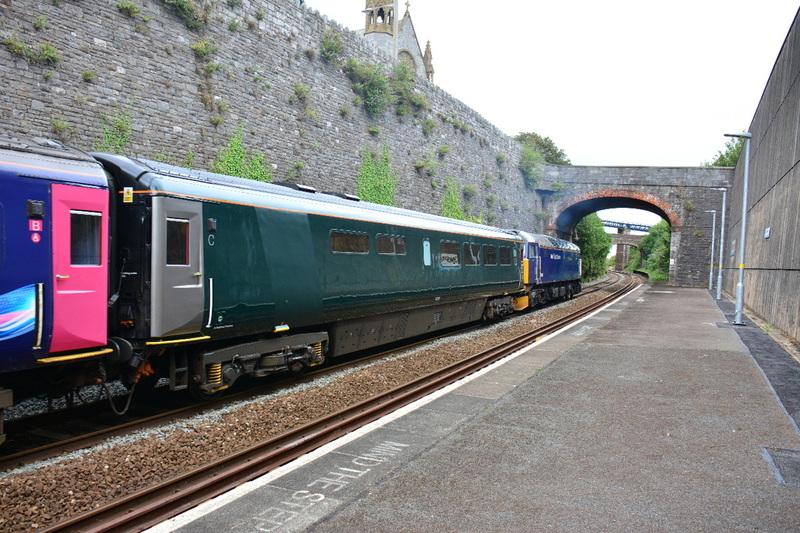 Looking very smart. 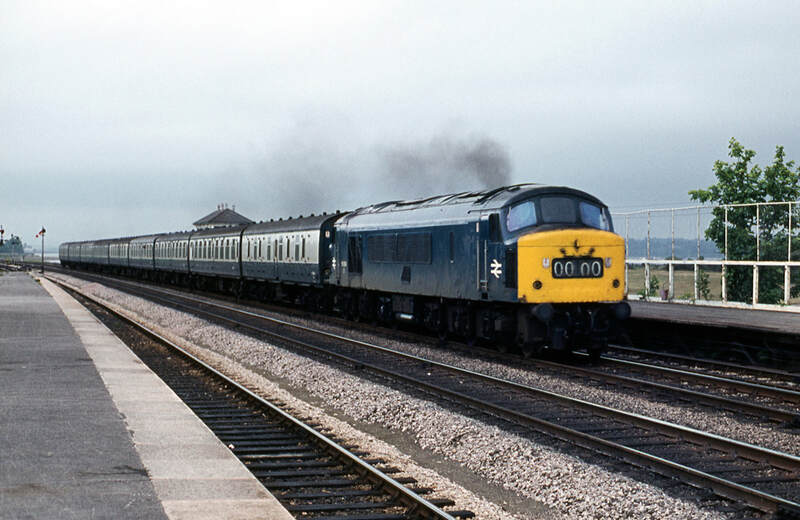 4th May 2017 Copyright Bernard Bates. 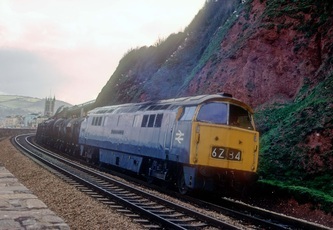 47805 at Cockwood with the Saturdays only Paignton-Wolverhampton. 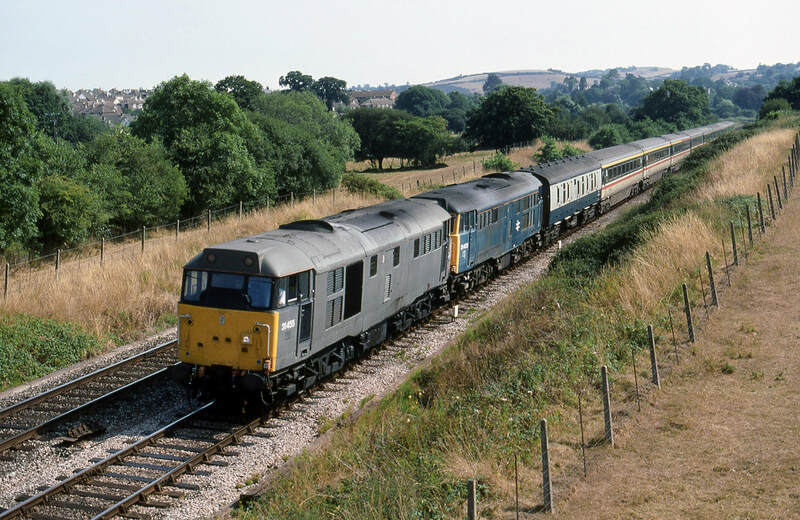 5th August 1989 Copyright Ron Kosys. 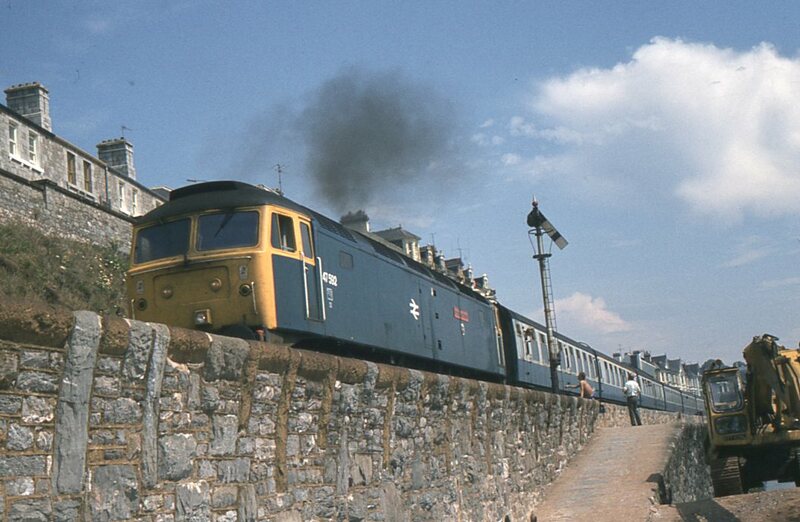 Note the DVT at the rear. 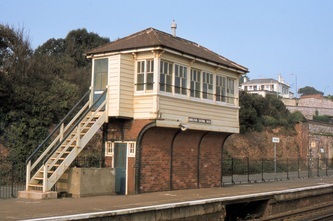 Cockwood Harbour. 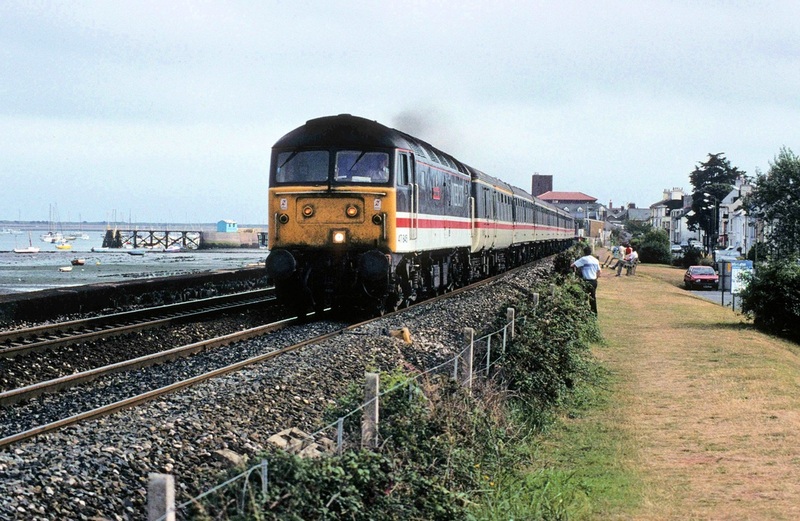 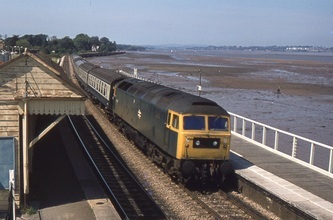 P825 A hybrid unit, common at that time passes Cockwood Harbour on the 3rd May 1991 Copyright Ron Cosys. 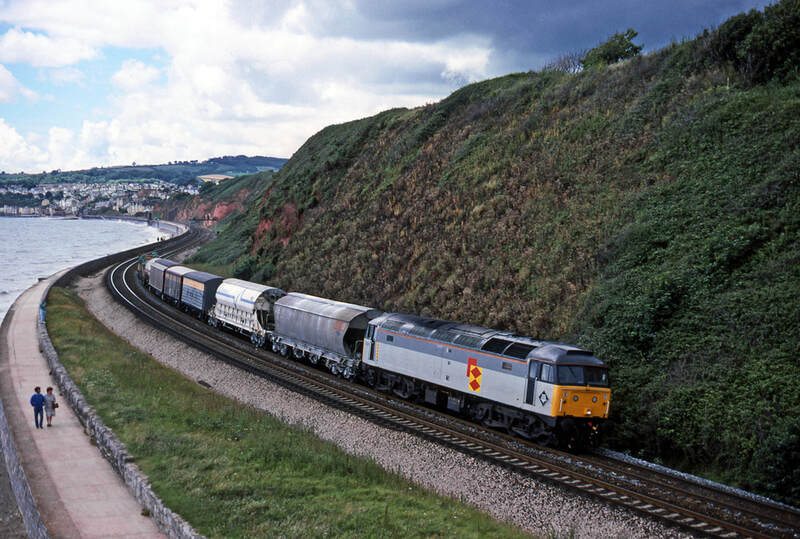 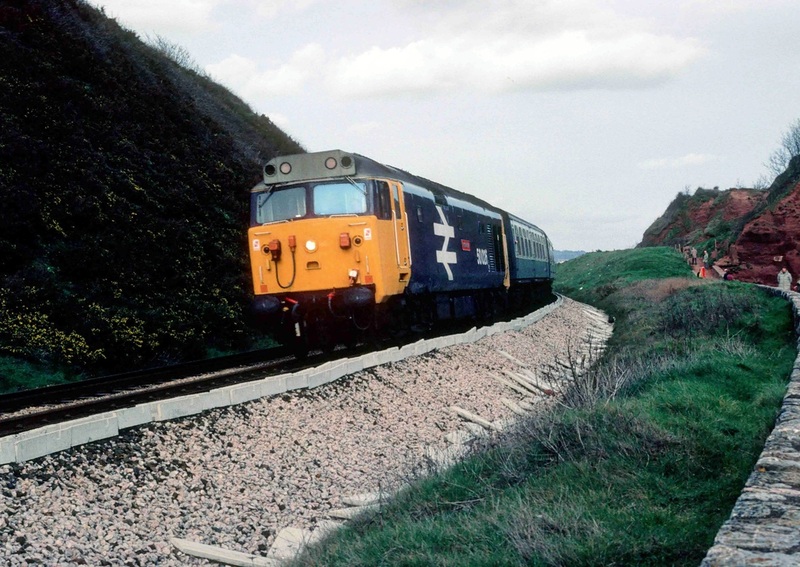 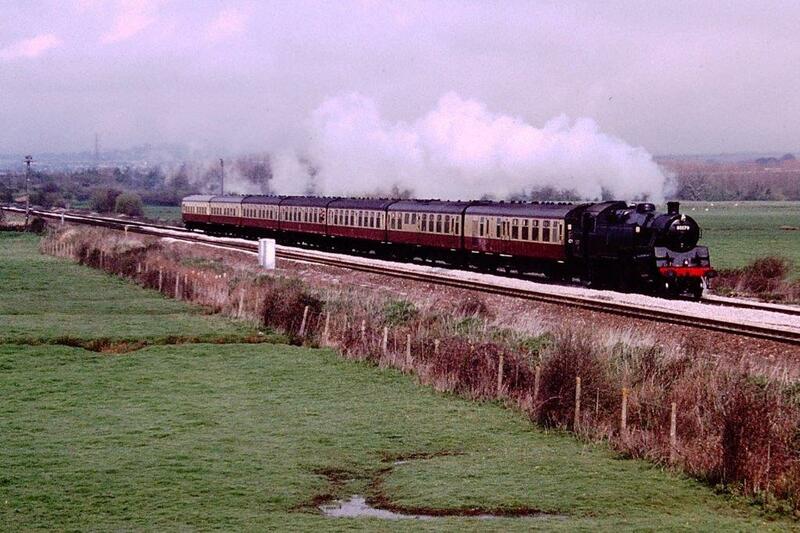 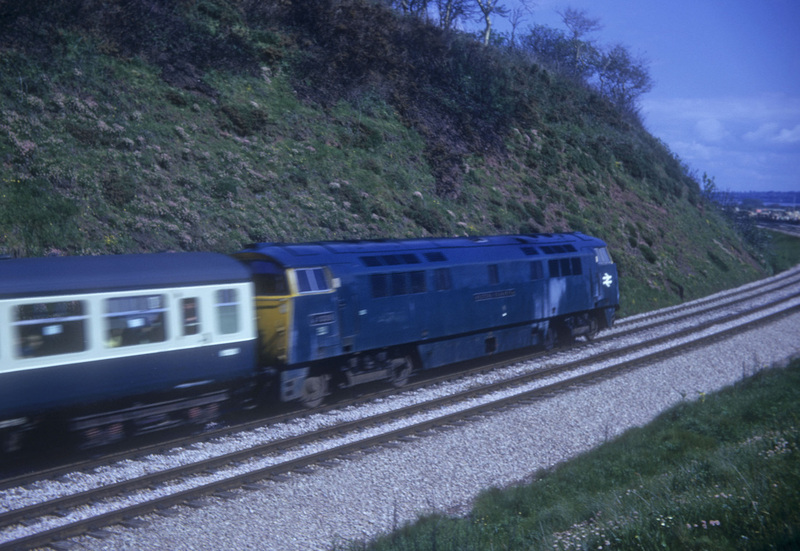 A classic shot with 80079 on the 12.00 Exeter-Newton Abbot seen near Exminster on the 4th April 1999 Copyright Paul Barlow. 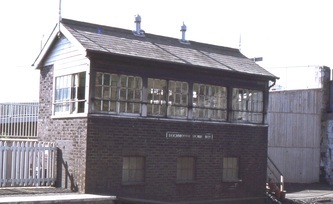 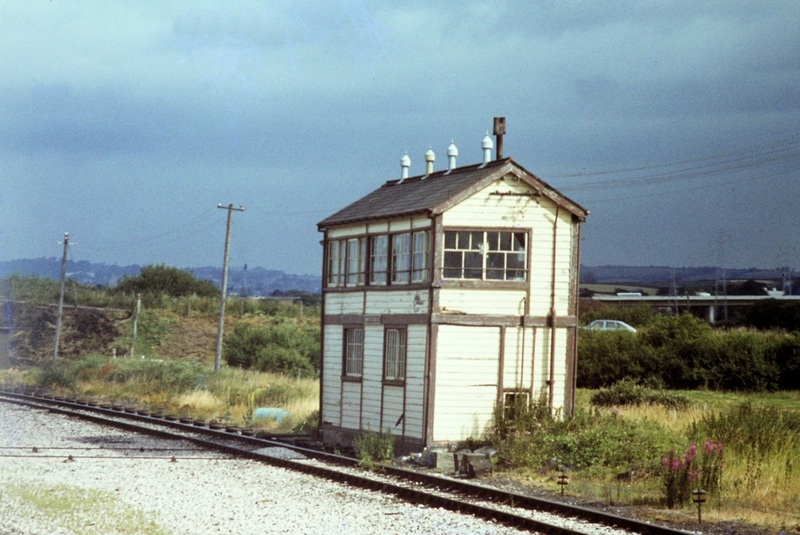 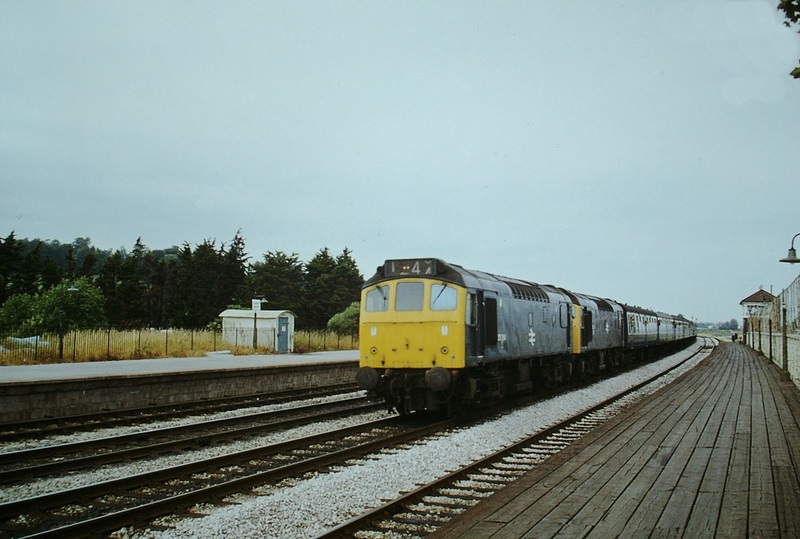 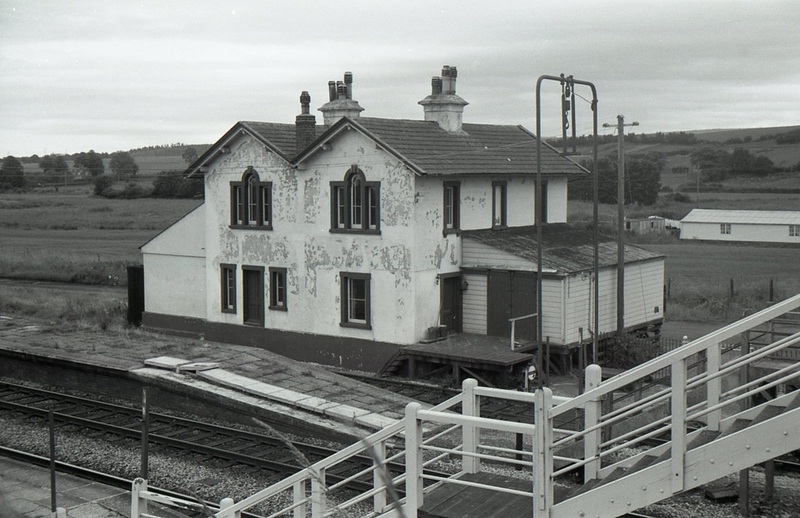 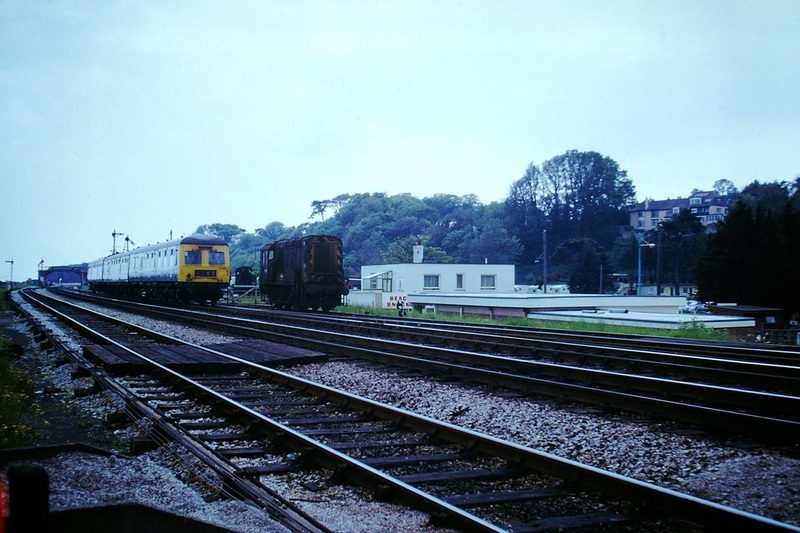 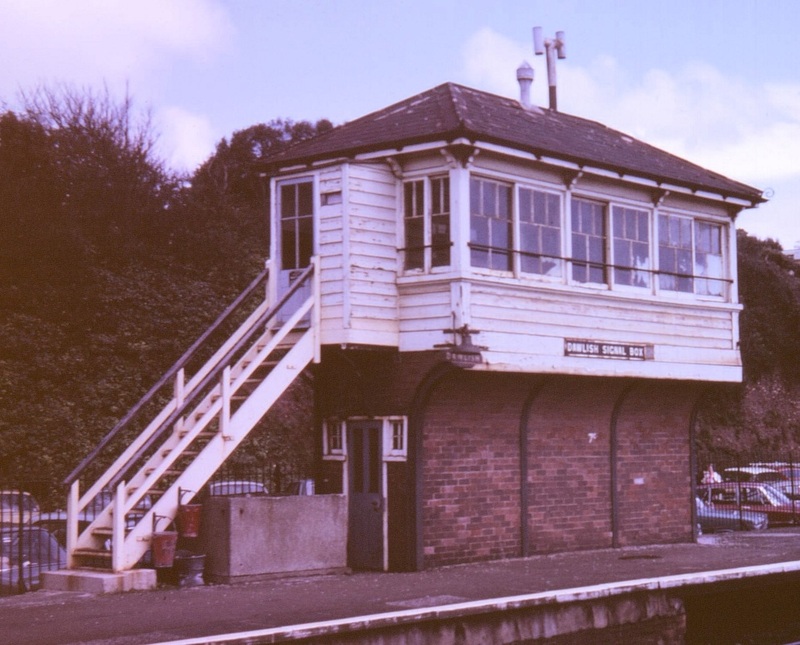 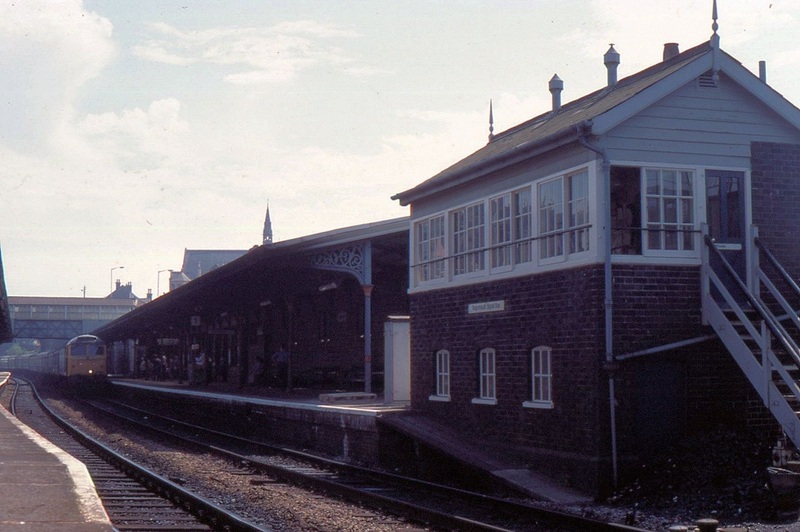 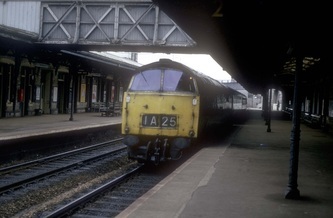 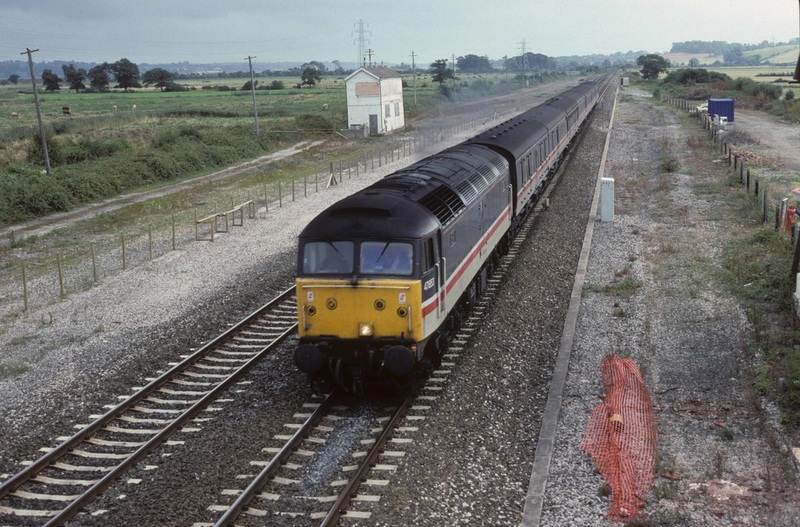 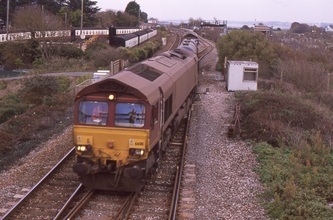 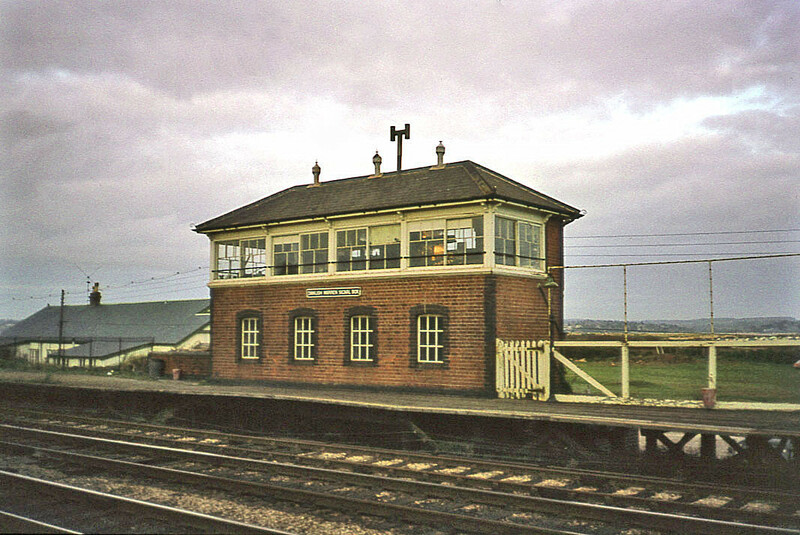 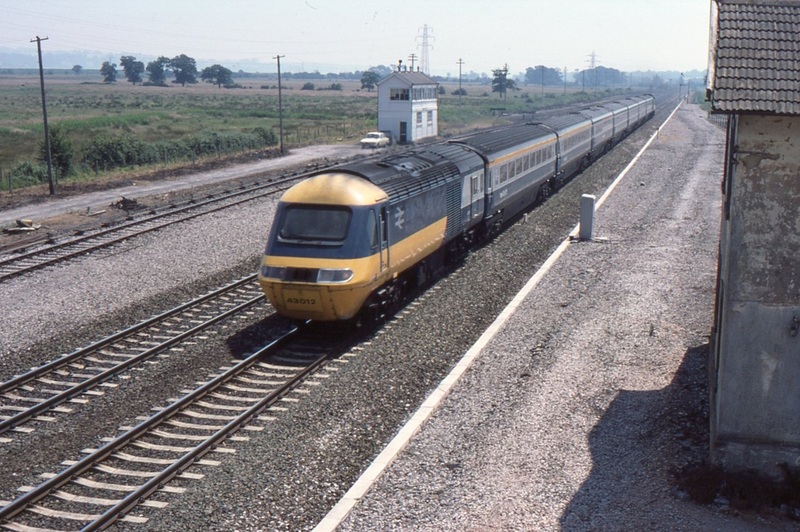 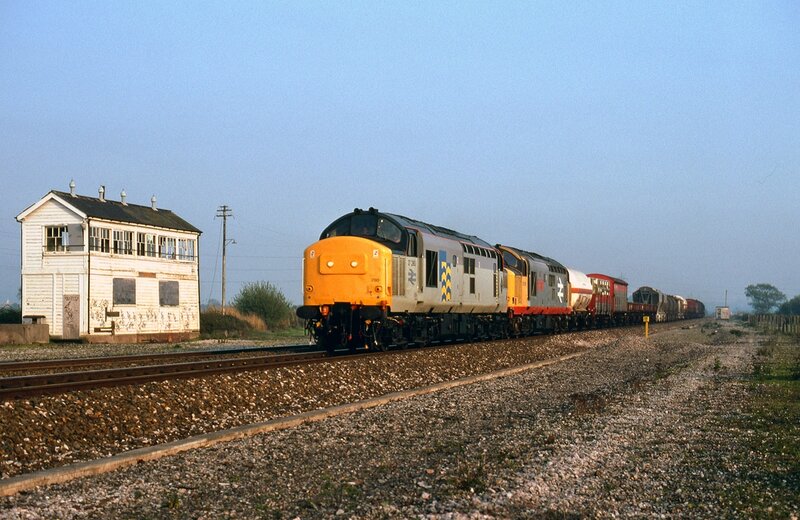 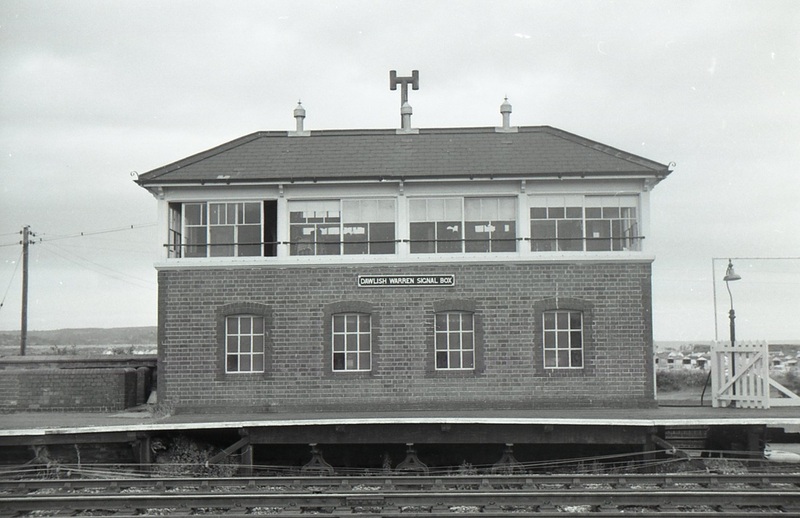 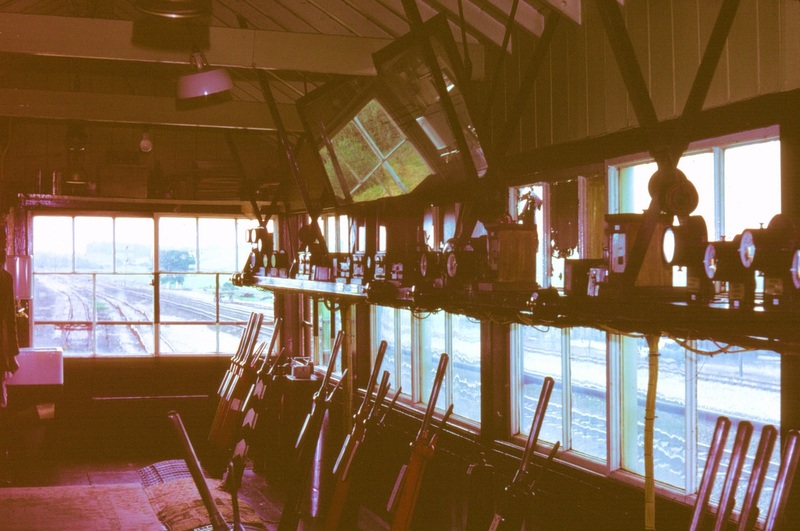 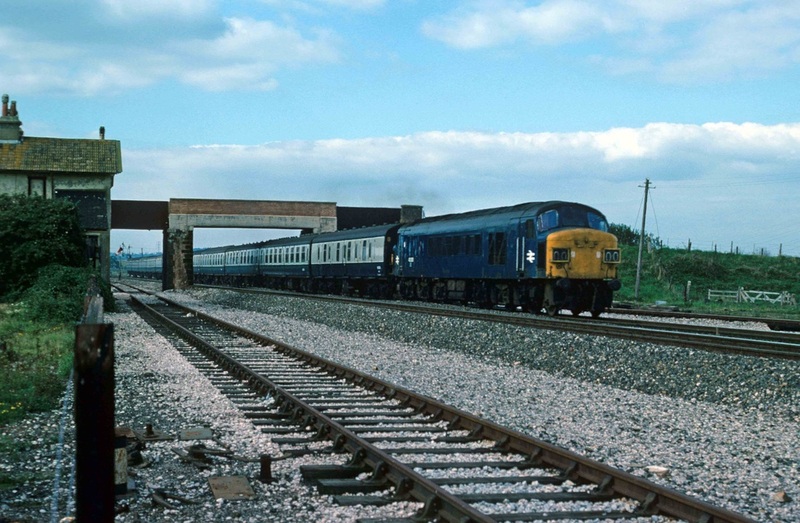 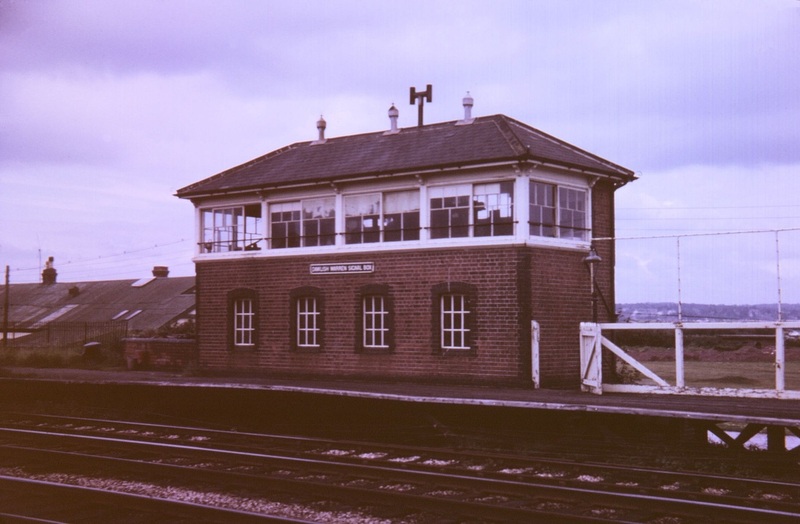 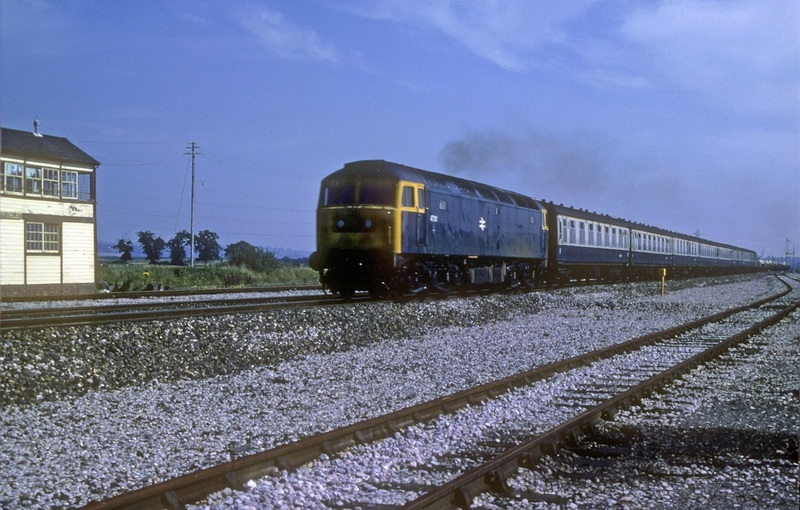 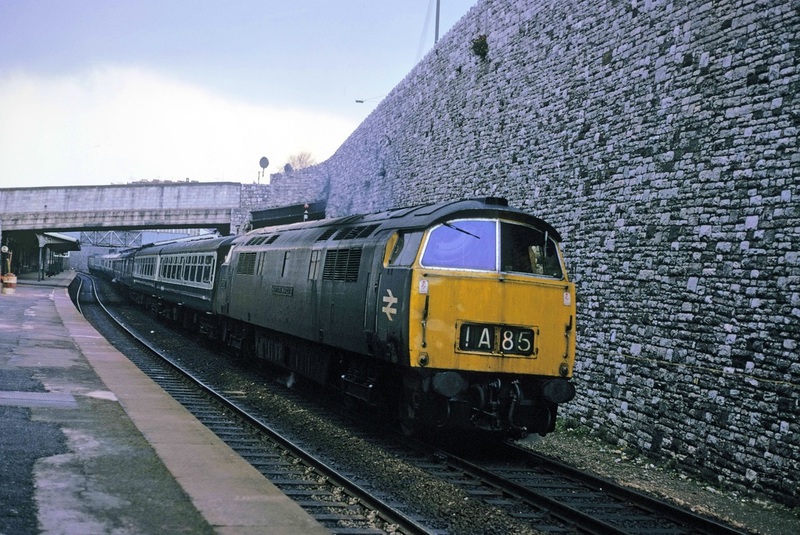 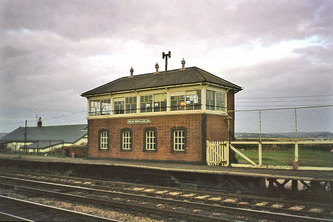 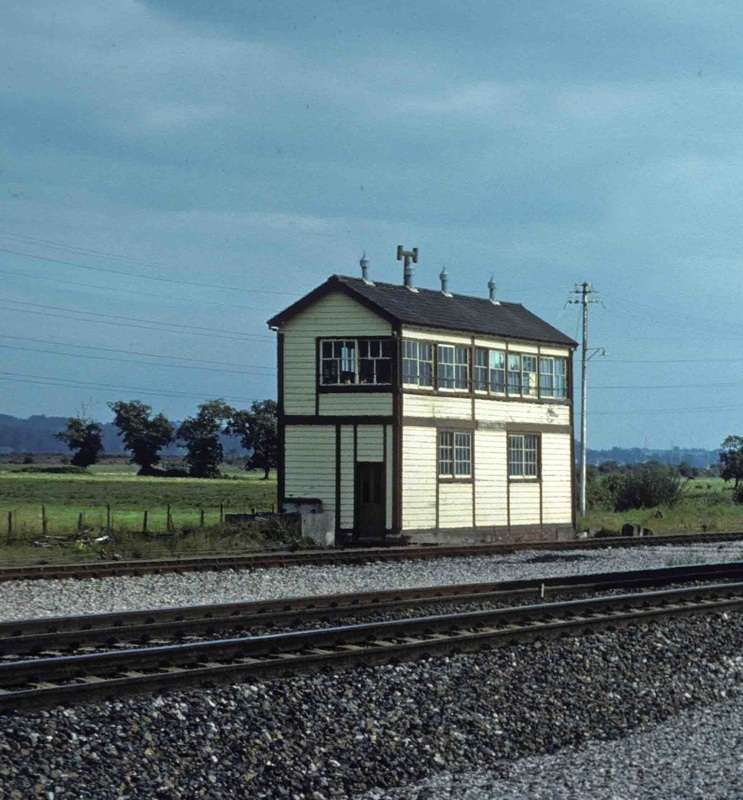 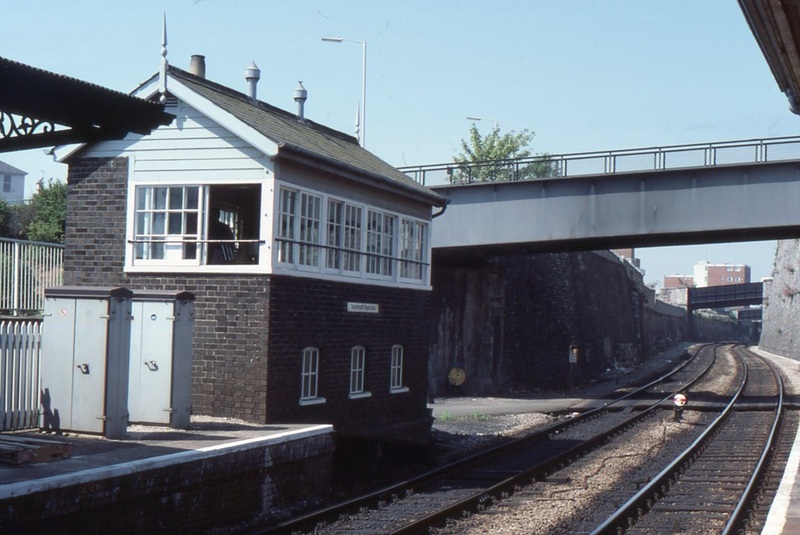 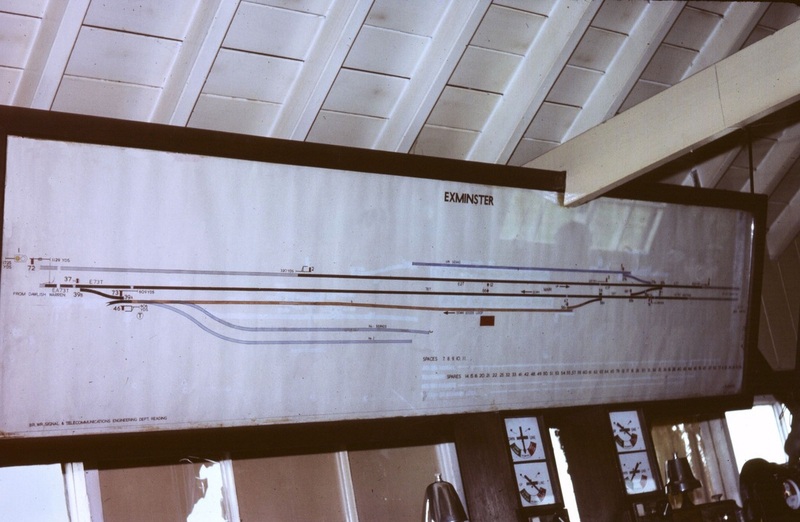 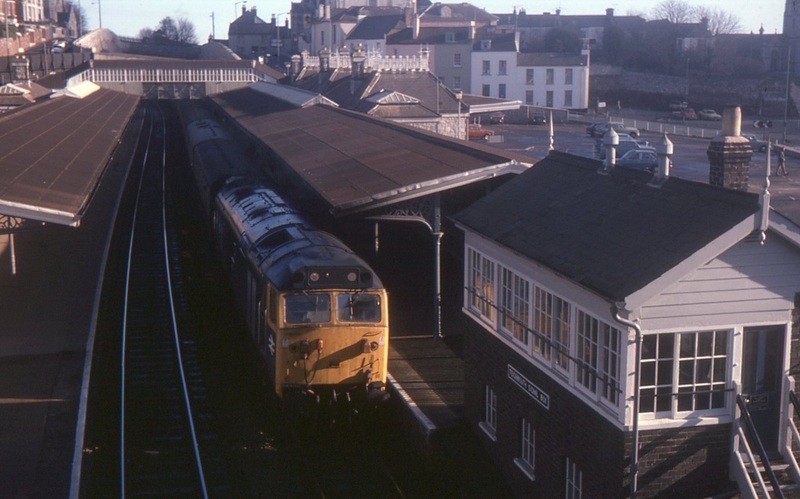 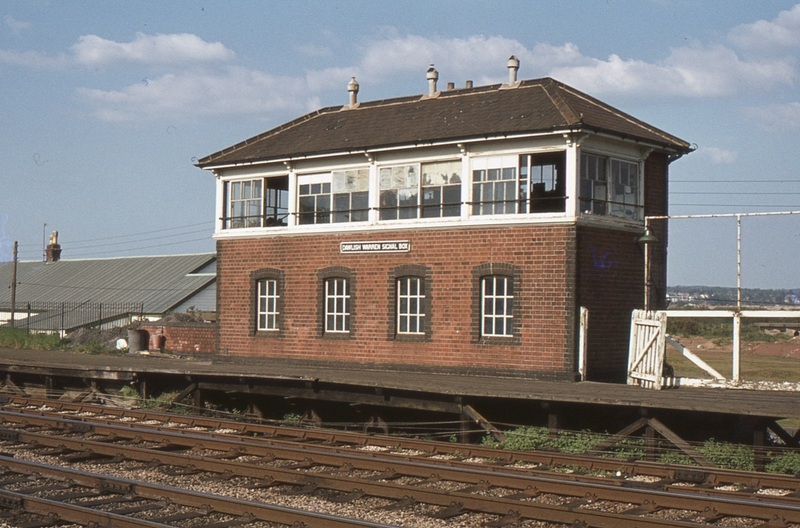 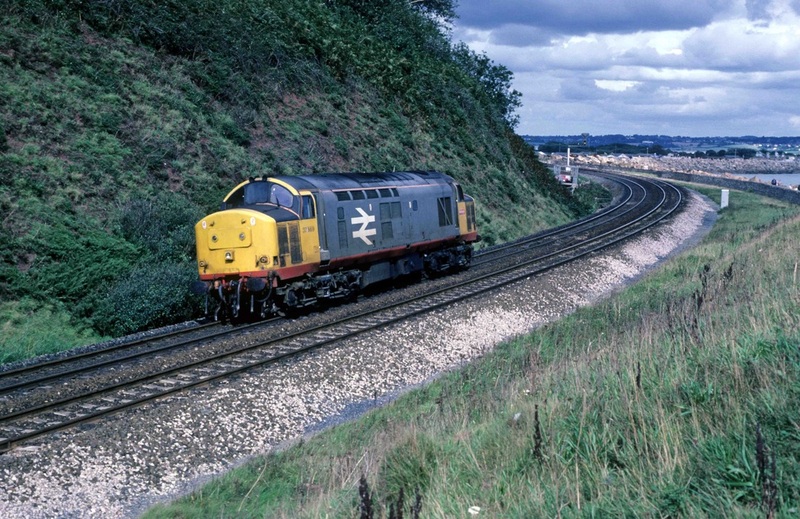 790728d Exminster Signal Box - Copyright Roger Winnen. 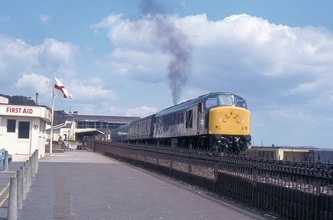 Note traffic on the M5 bridge in the background. 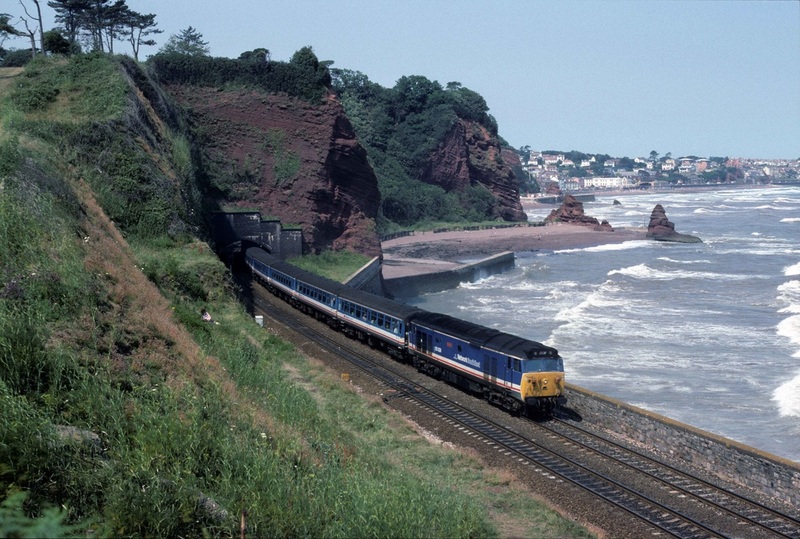 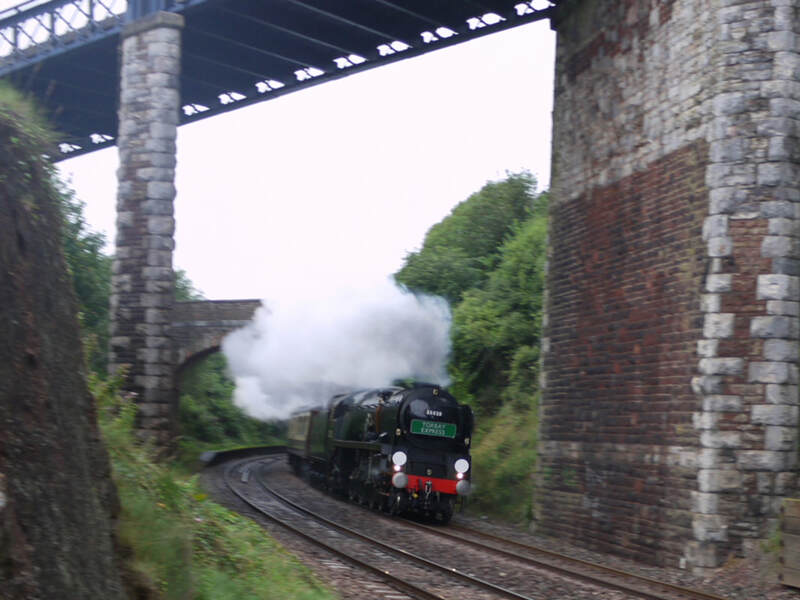 If you want to see more in this direction go to Devon Main line Exminster (Ecl) to Exeter.